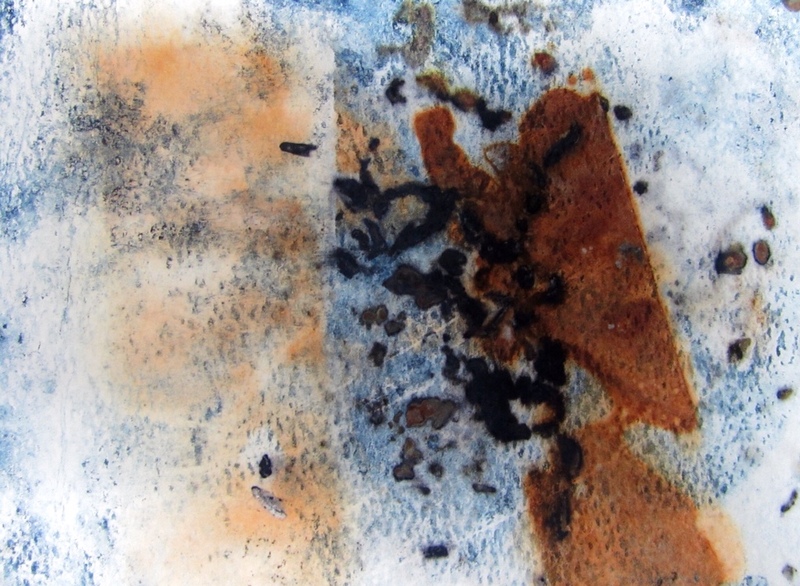 Winter means art indoors and the studio is my refuge. 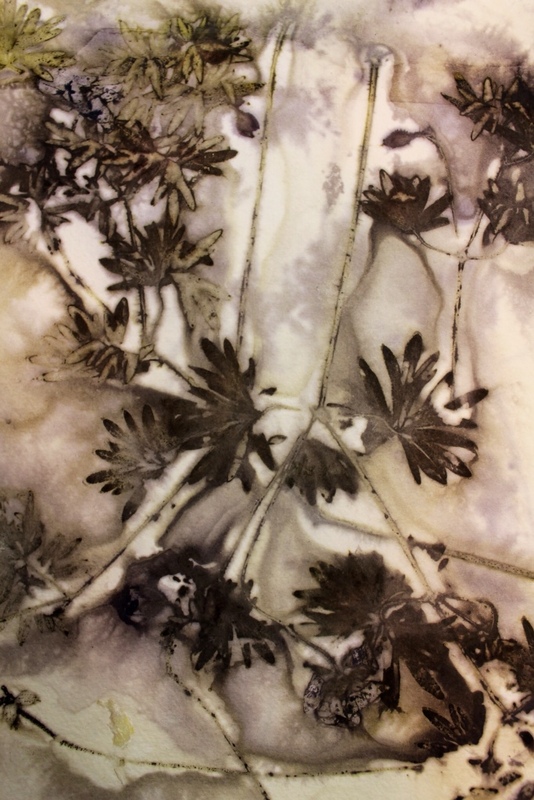 For natural dyeing and eco printing, I use my stash of dried plants, dye powders and whatever fresh plant materials I can find in the fridge or a florist bouquet. 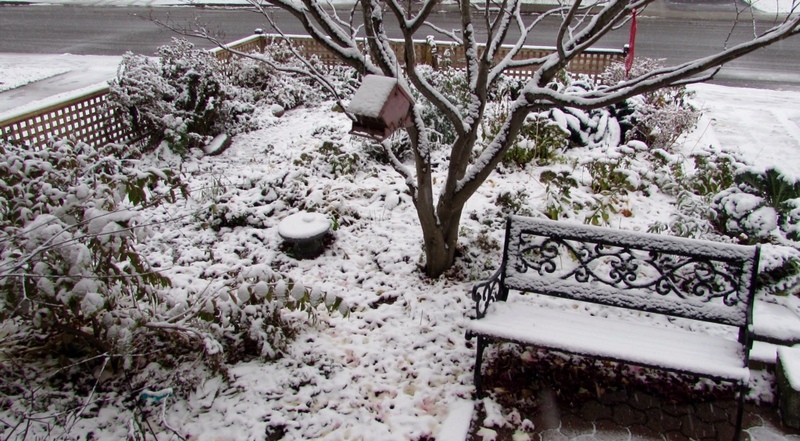 The first snow in the kaleyard this year sent me scuttling about to bring in one of my Potted Plant Pets that, forgetful gardener that I am, I had neglected all summer and fall. Out of sight, out of mind: it was hidden, pot and all, by the huge foliage of that Monster Kale. Si when the vernight temperature fell to about two degrees, that was curtains for the leaves on the indigo (Indigofera tinctoria). 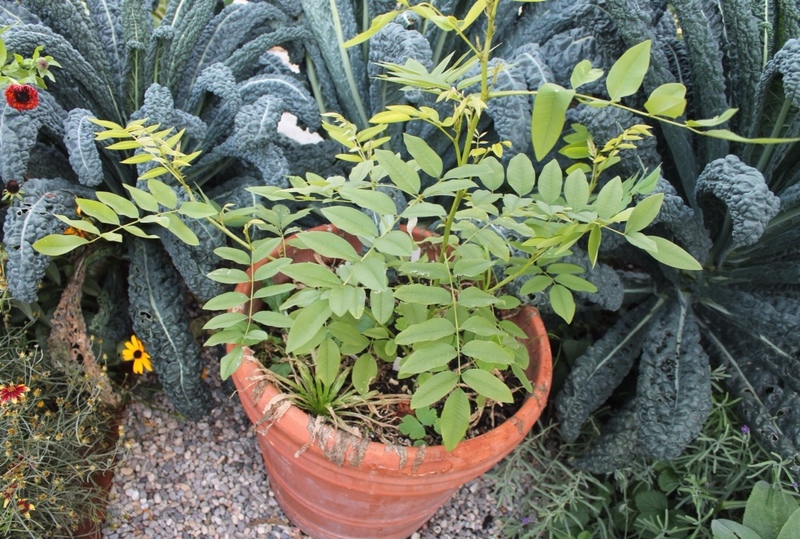 I had started the seeds indoors in March and set out the largest plant In a pot after the last frost in late May.The indigo looked like this (below) in June beside the Kale Monster; by November, it was hidden completely by the dinosaur kale. 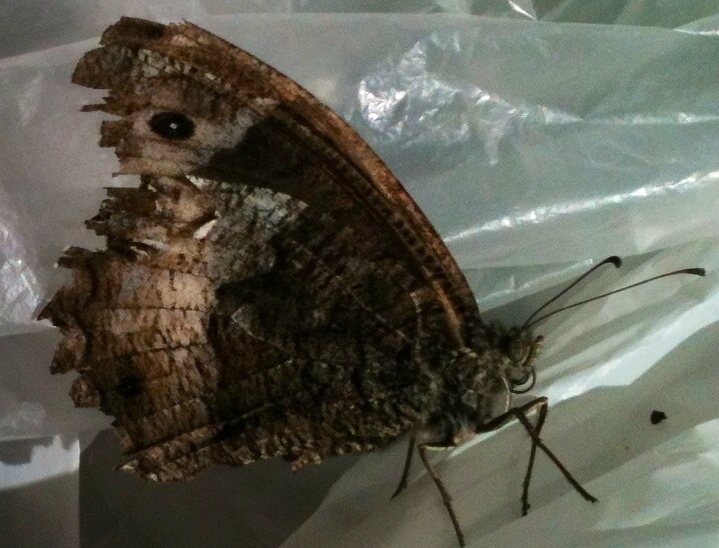 Let us see if the now-leafless indigo pet will revive. 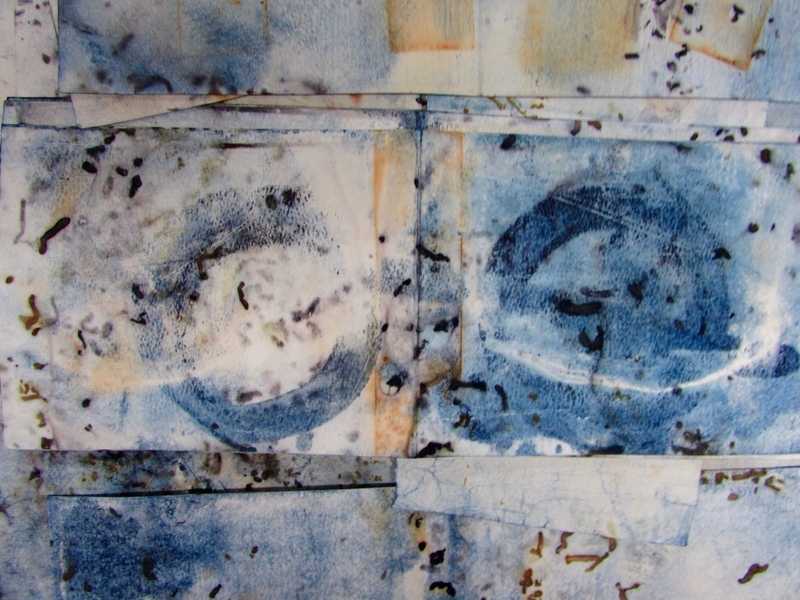 More below on this indigo and its gifts to the dyer. 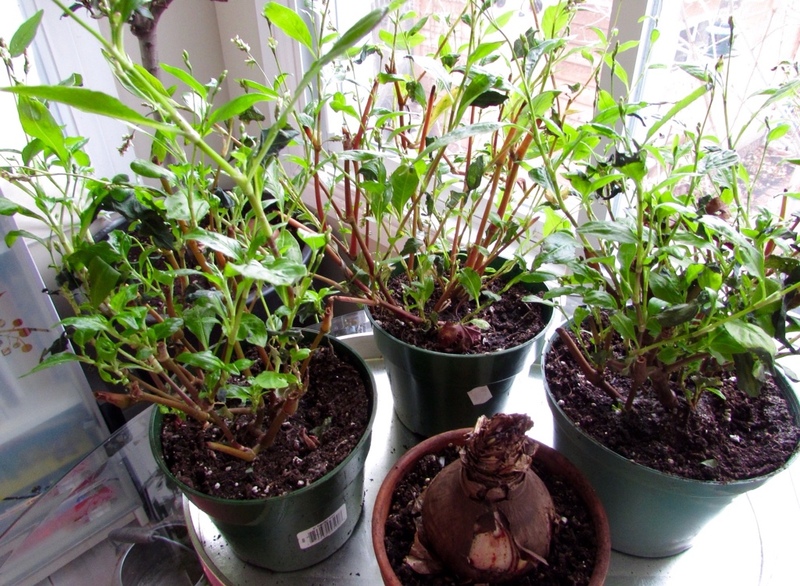 Meantime, I did manage to bring in the Japanese indigo (Persicaria tinctoria) and pot it up for overwintering. 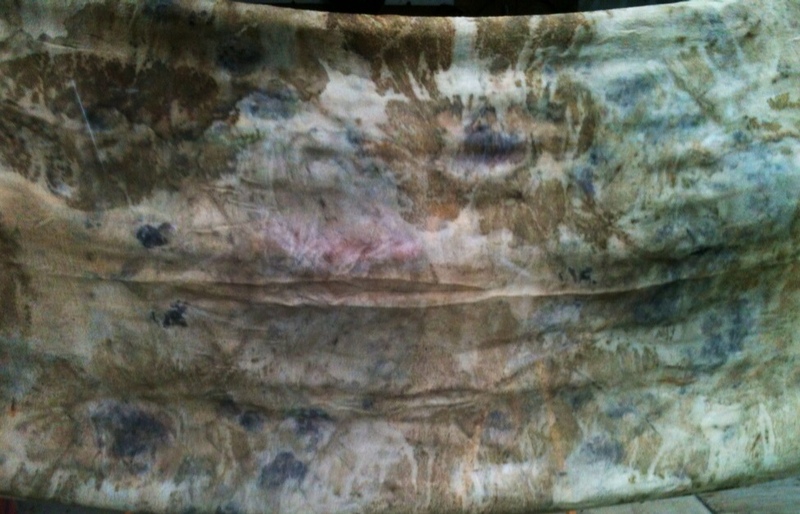 This type of indigo also yields blue pigment so I have dried several batches of leaves to try winter vat-making. In the past, I have found that the plants will set seed in their pots and produce seedlings in late winter. But for good measure I have saved seeds this year. 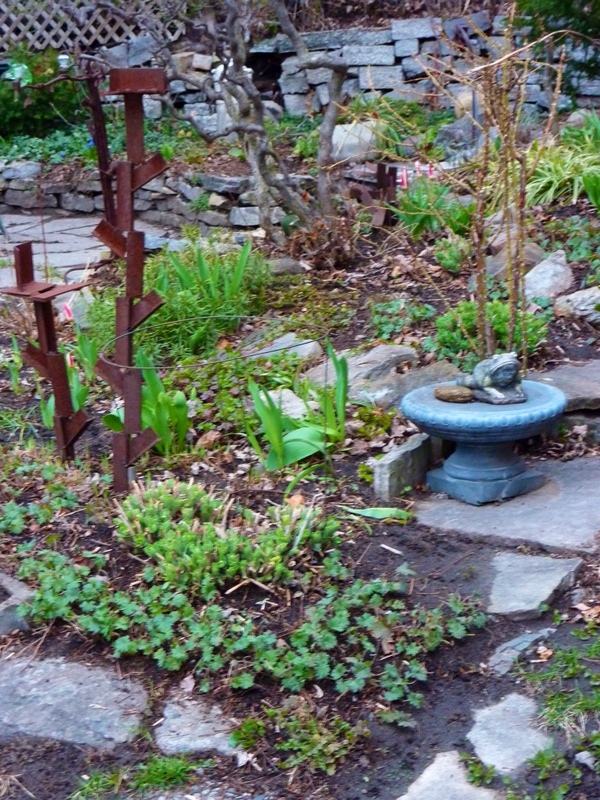 One of my dyer friends here in Ottawa says she even finds seedlings in her compost in spring! That is a plant with a huge will to survive, even if with a reputation for short seed viability. 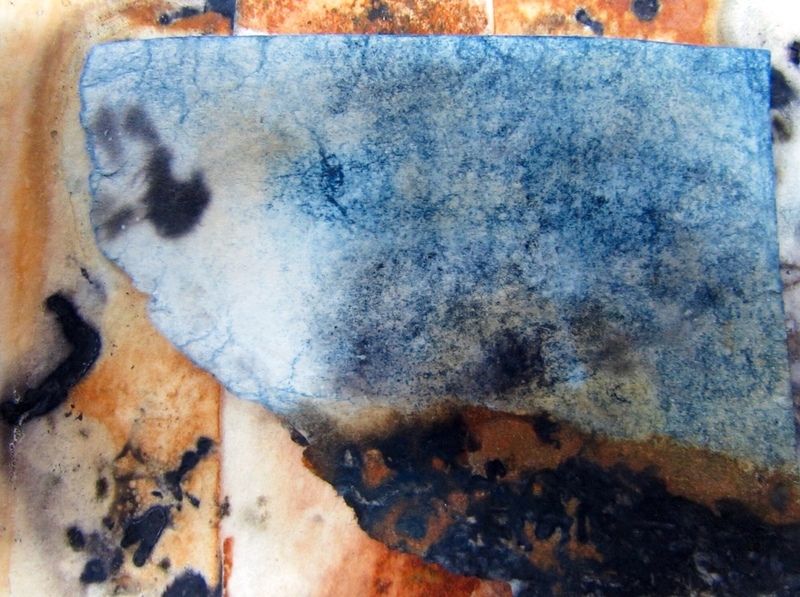 The blues I obtained (above) from my first-ever Japanese indigo vat are, as you can see, on the turquoise side of blue. Later in the year ( when I am back from January in Brooklyn where our youngest is about to have her first baby) I will have a go with a vat using dried the Persicaria tinctoria but likely not before February. 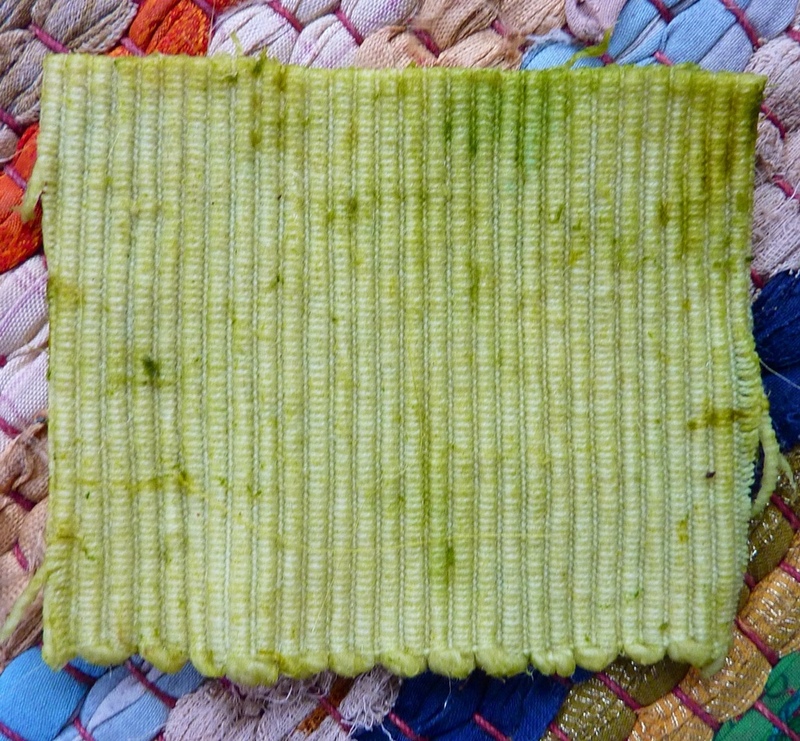 On to dyeing with other indigo now – the Indigofera tinctorIa. 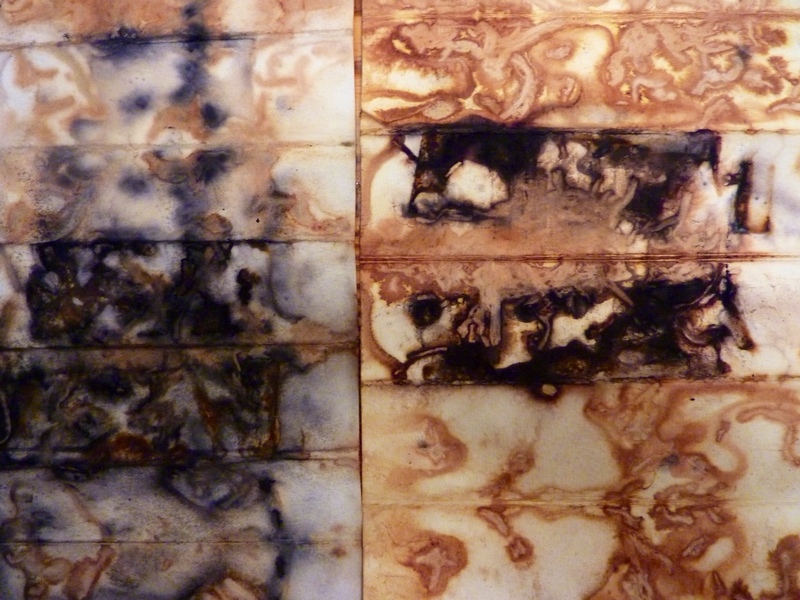 I am chiefly interested in using this indigo for my Artist Books. 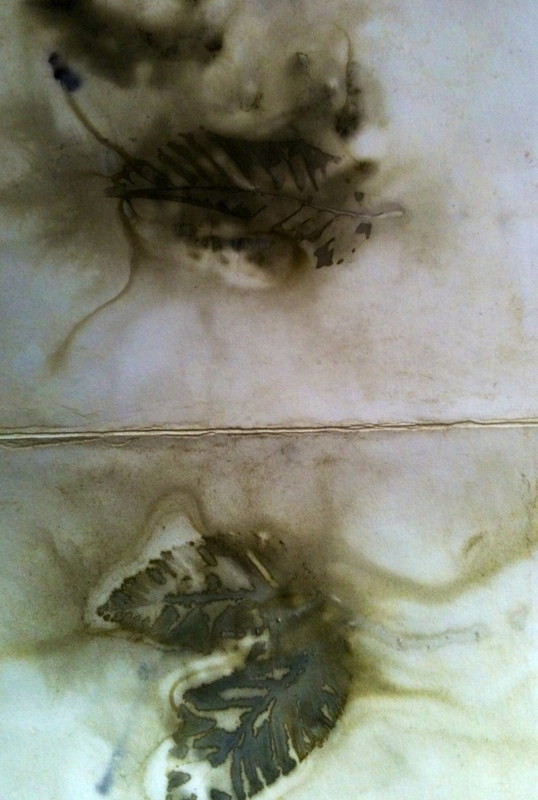 My current focus is, as you might know by now, Artist Books made with and about native plants, the Medium being the Message in my approach to the work. 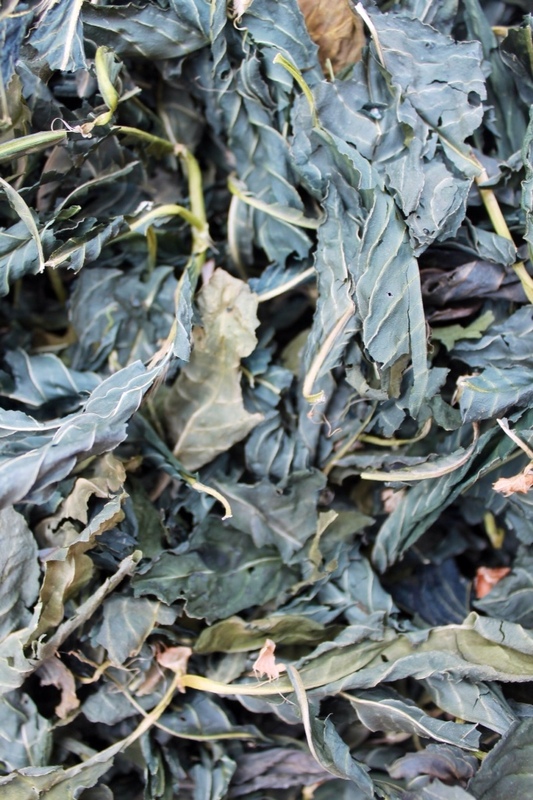 But I am not so granola that I shun non-native plants like European kale, Japanese indigo and indigo (probably) from India. We are all strangers and sojourners on this earth, are we not? And we likely come from somewhere else, and will end up somewhere else again, more than likely. I am from Orkney, as it happens, but live now in Ottawa, Canada, via Liverpool in England. 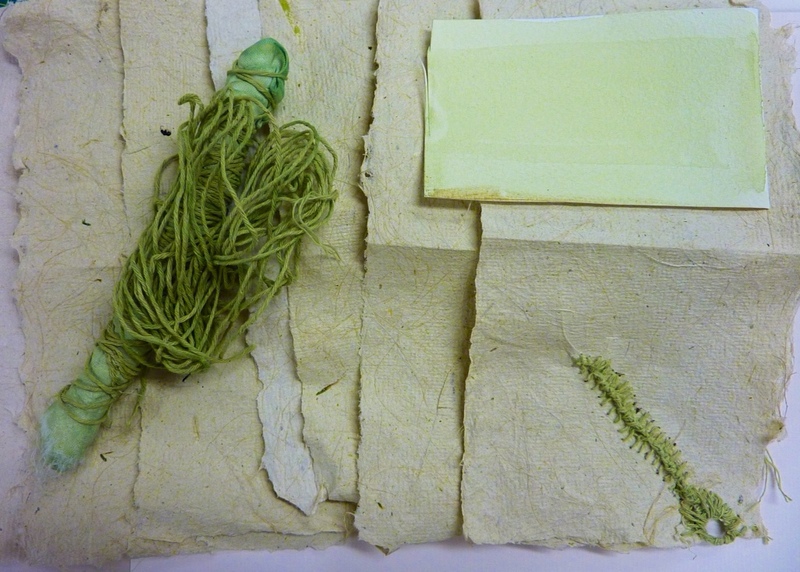 Green Immigrants have a valued place in my garden; potted, they are Plant Pets; they will always find a place in my repertoire as a dye artist even if native plants are my garden focus. We have transplantation, translation and removal in common, and the search for where to put down roots, scatter seeds and lay one's head. 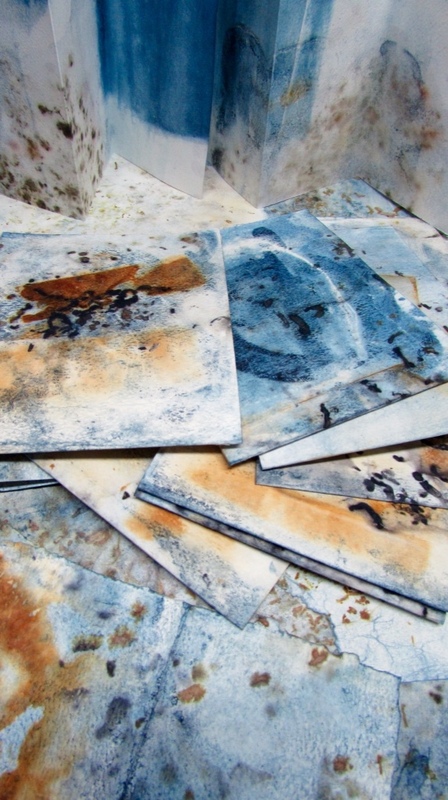 Indigo paper has an interesting history in the book and paper arts, too. ( A discourse on that topic will follow at another time, dear Reader! ) 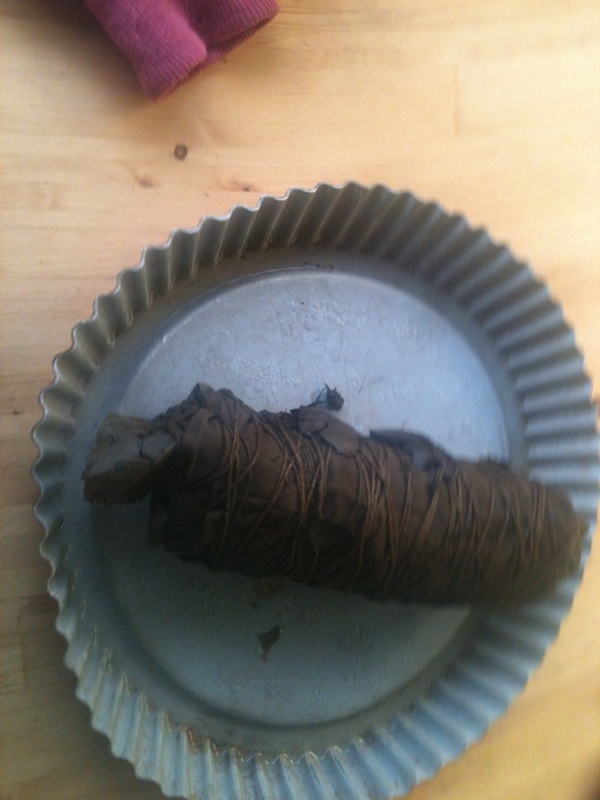 Indigo papers will be a fine little Rabbit Hole for me to disappear down with my pre-reduced indigo, taking along rust and black tea leaves as companions, plus some others (like beeswax) to sustain and surprise us on the journey. 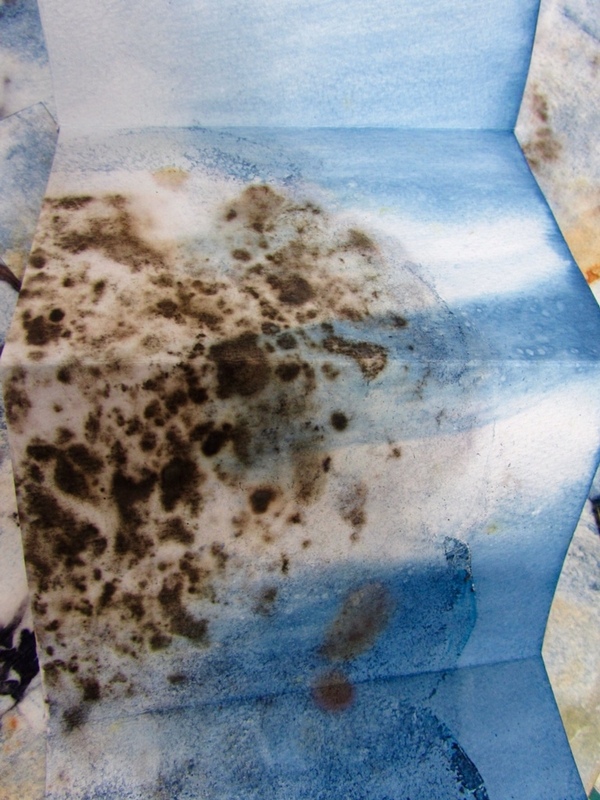 Feeling connections to the traditional use of indigo for colouring papers of various qualities and types, especially for the express purpose of hiding imperfections, I have begun to accumulate indigo-and-rust dyed materials to create a series of Artist Books, with tea leaves for tannins to blacken the rust. 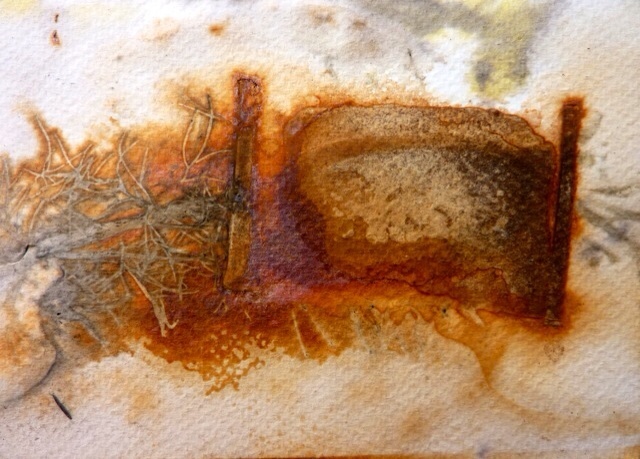 And some beeswax to trap the rust, like insects in amber. 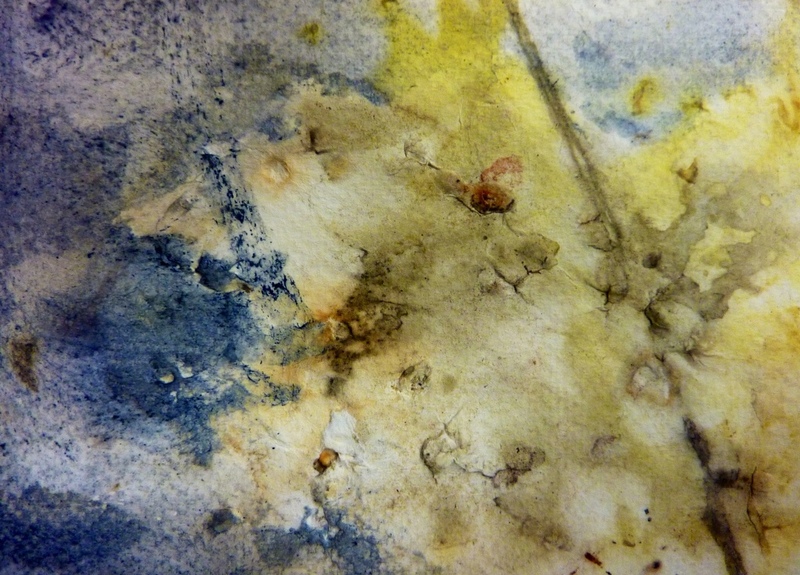 And dye and wax to cover over many things, like the mold on paper left too long soaking in alum water…And, O that divine blue and orange combo, the Impressionist painter's expressive colour gift to humanity and art history. 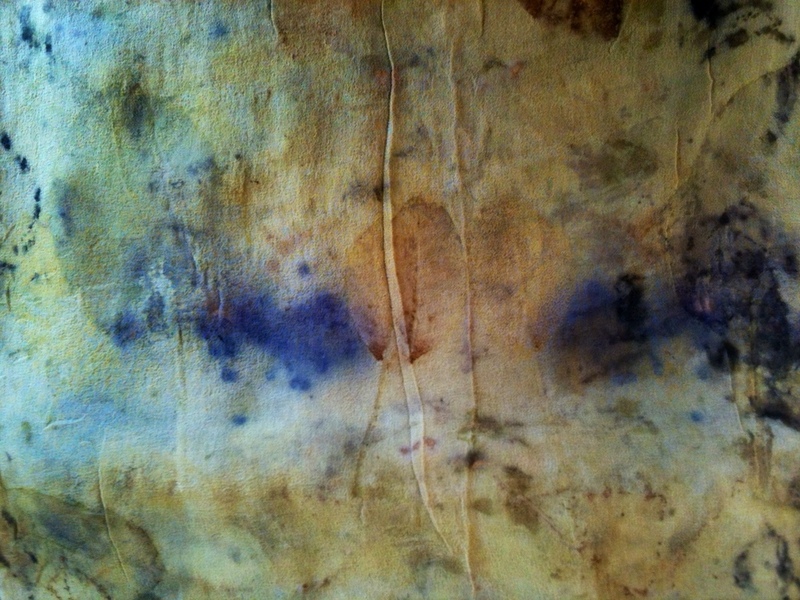 And here is some linen printed with indigo, rust and tea: this will become book cloth. 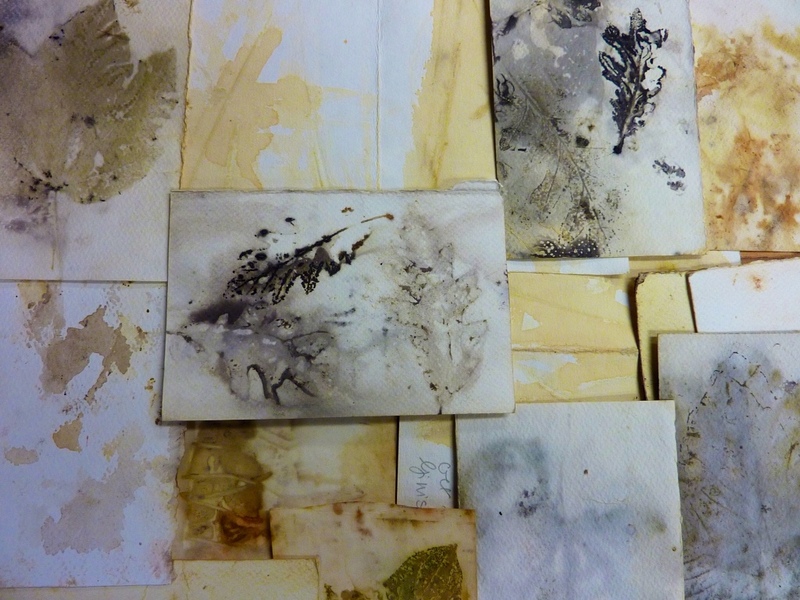 Finally for this post: some Artist Books, including work from a bookbinding workshop offered by the generous Genevieve Samson, medieval book conservator at Archives Canada and CBBAG member. 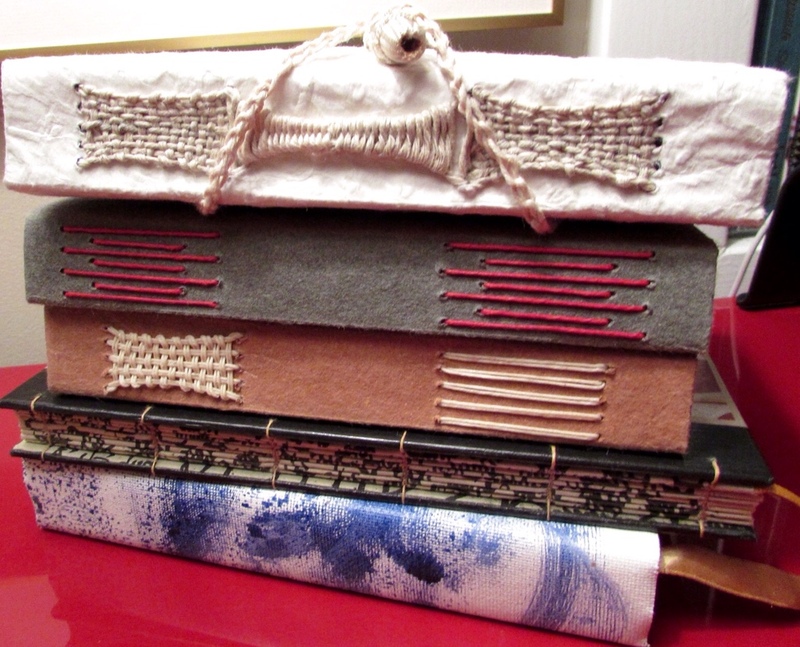 Longstitch binding: the white one is mine, the next two are Gen's demo books, the coptic binding is by Gayle Quick of CBBAG and the blue and white on the bottom of the stack is a canvas wrapper I painted with acrylics. Blessings on your day, dear Reader. 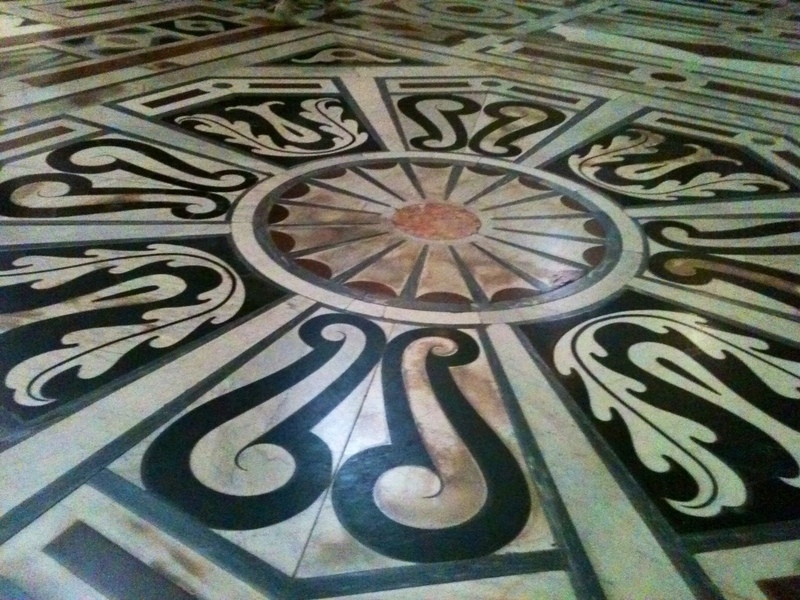 Thank you and welcome to all the new folks who have joined the blog since last post. 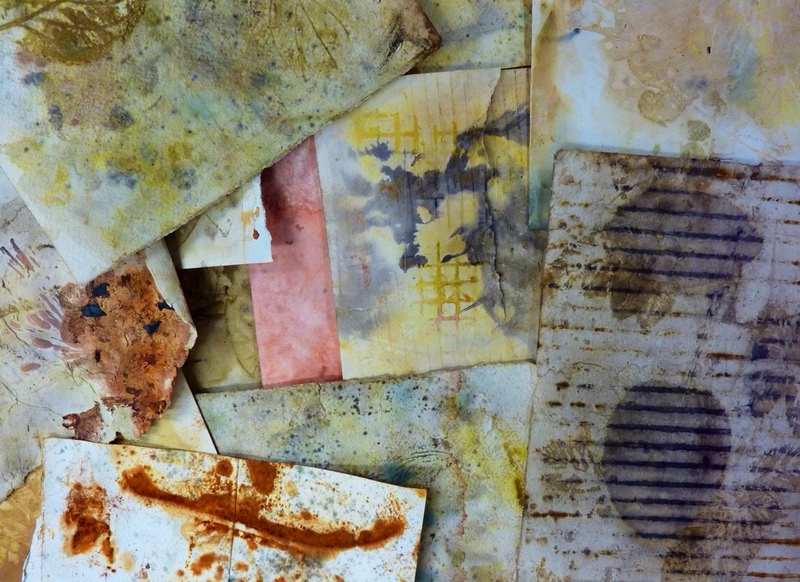 At Arte Studio Ginestrelle, my studio set up for printing on paper was dependent on found materials, whatever could be repurposed for steaming papers and textiles. 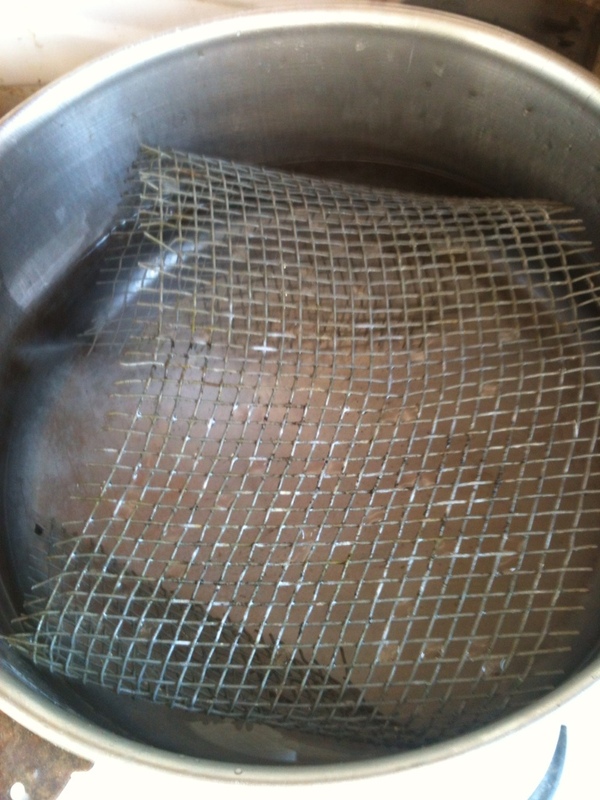 I used wire-mesh screen material scrunched up in a pot or a lasagna pan with a few inches of water below and a large terracotta tile for a lid. A Gypsy Campfire was not an option because we were located in the Regional Park of the Subasio and thus subject to strict forest fire controls. 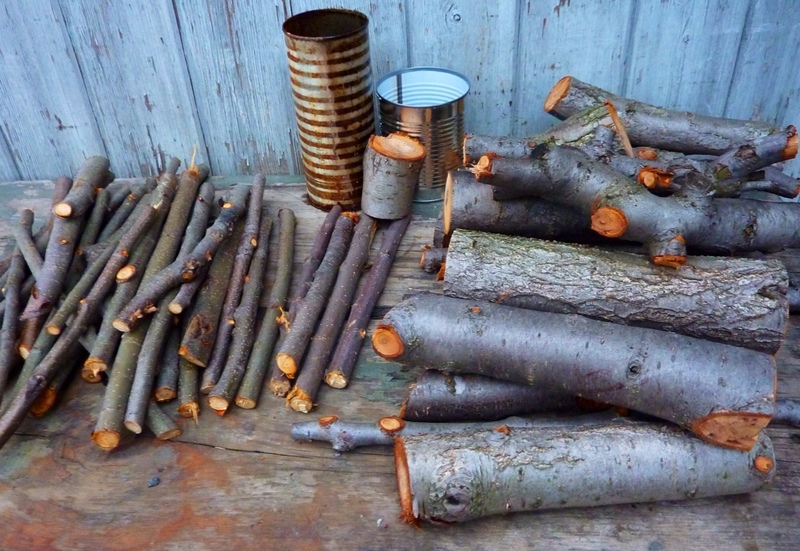 My heat source was propane, the same as we used in the house for cooking (when not using the wood stove). It was a simple and effective set up in an outside barn studio. With a daily temperature of around 75 degrees, that was no hardship! 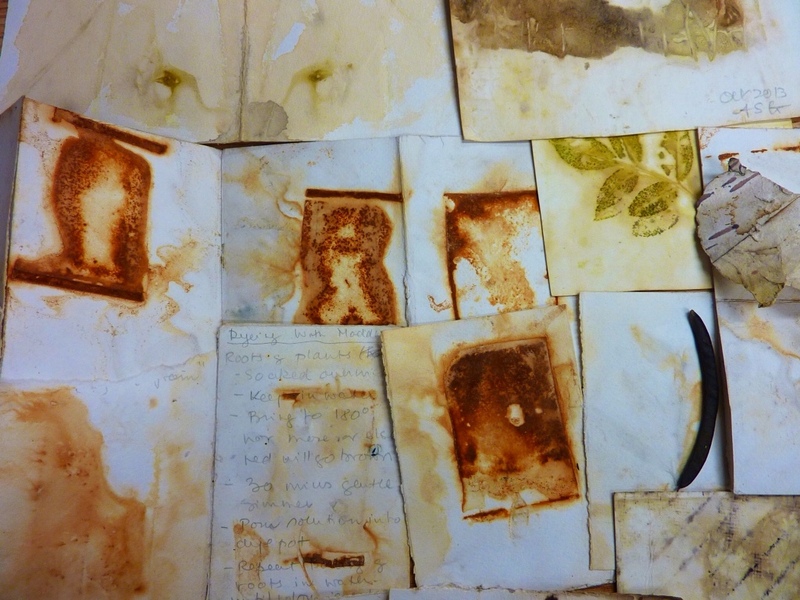 Here are some samples of my papers that were printed in the first week or so of my residency when I intentionally printed only one kind of plant on each page or between two pages. This was to enable me to judge the colours I could obtain without the colour mixing that occurs when you bundle several plants together. 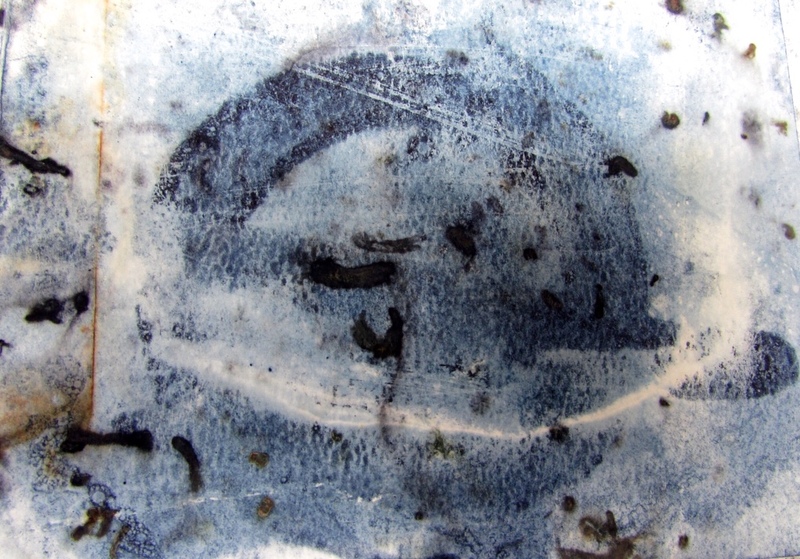 Post ecoprinting, I often treat paper and textiles surfaces as paintings, taking the colours and forms in directions I choose as counterpoint to the spontanaity in colour and form that is the result of an eco print. 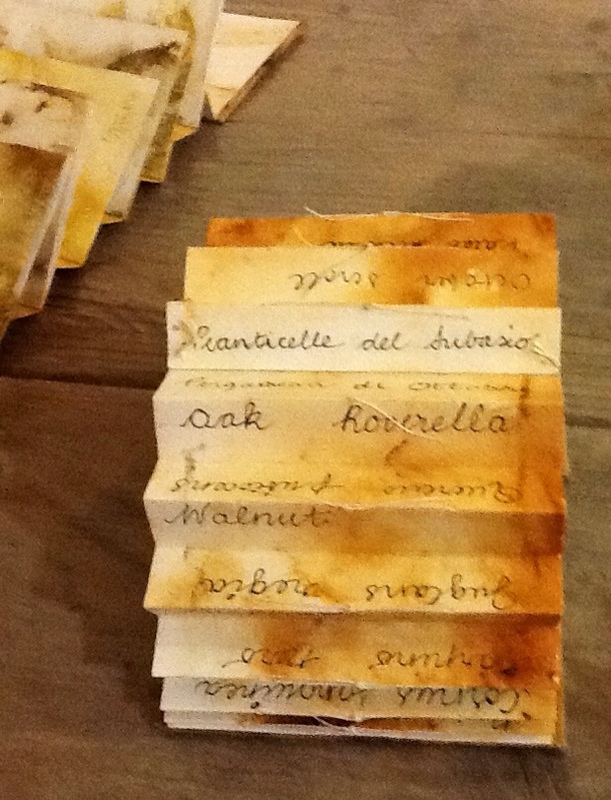 After printing this first set of papers, I enriched their colours in various ways: by using iron as a modifier and painting on iron liquor: by resteaming the papers with other leaves or by using the same type of leaves again and steaming them longer or under more pressure; and by applying natural dye colour (e.g., madder) as powder sprinkled on or as liquid, painted on. 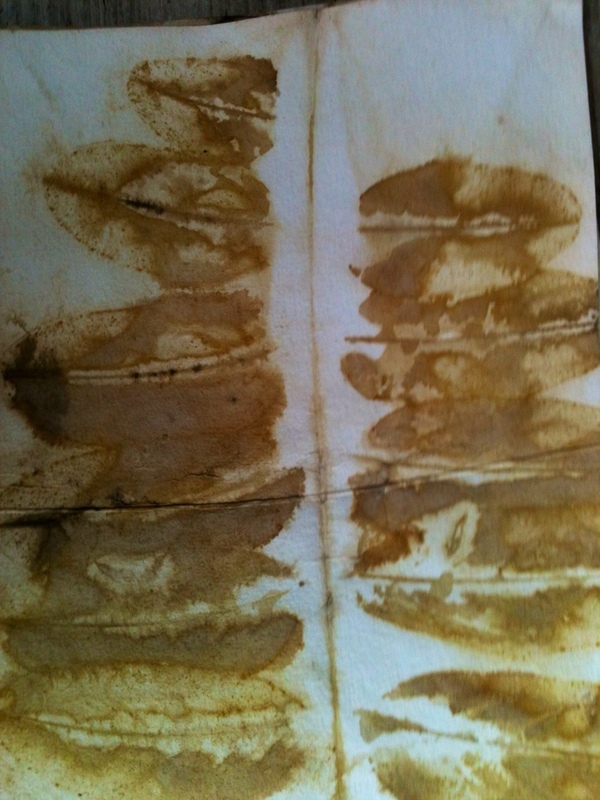 These papers are in their early stages of development in the layering. 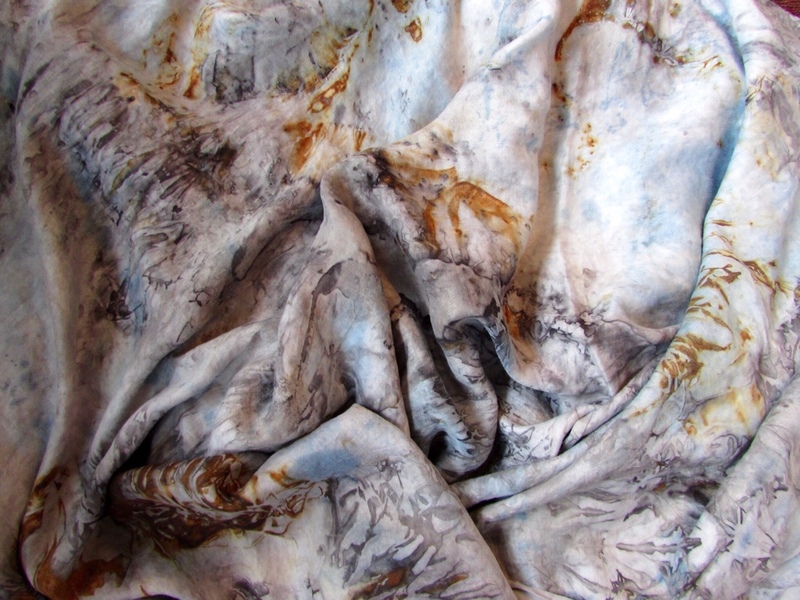 Later, along with the eco printed textiles, they will be layered with embroidery and taken along other colour roads. The grid prints are from the screen mesh and from a metal rack during the first printing. 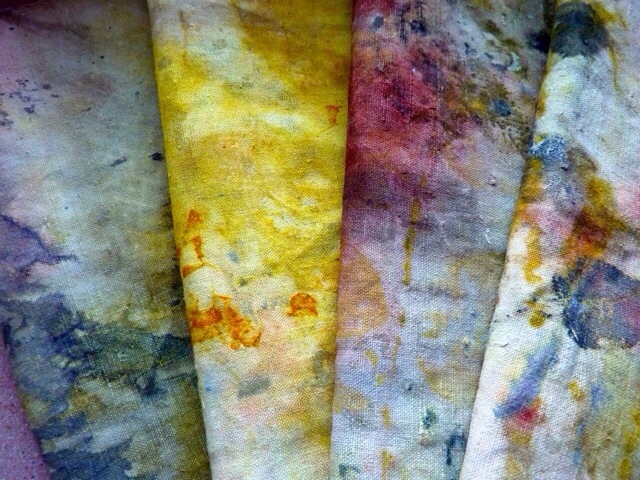 For layered colours, I made second and third printings. 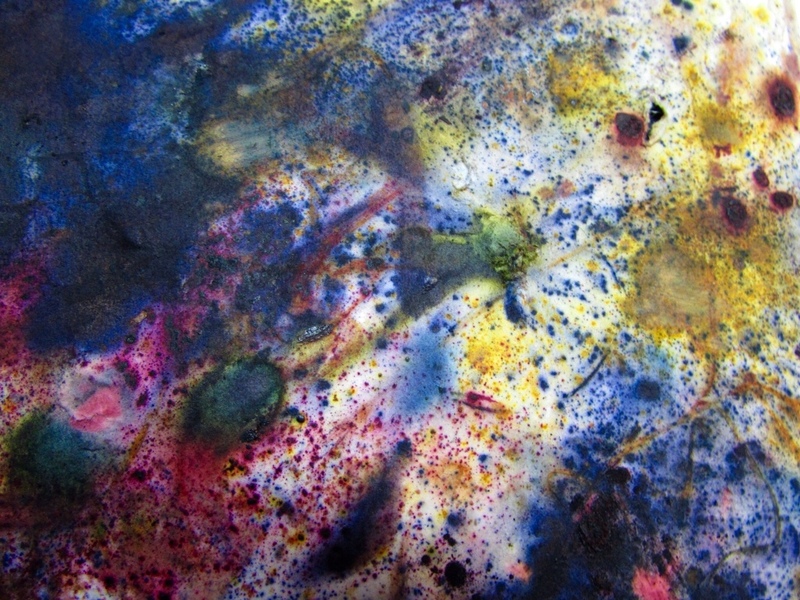 Rust and madder were painted on to give more colour post-printing; squishing blue coloured berries on top of the print introduced some complementary blue shades beside the yellows and oranges. 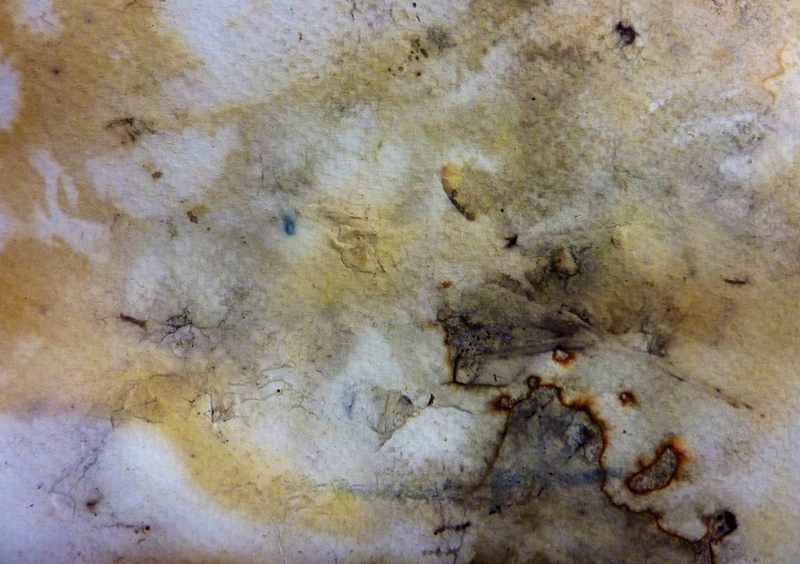 I enjoyed the “distressed” effects on some of the thinner papers caused by the high heat in the steambath and the fact that the paper sometimes tore or developed holes. 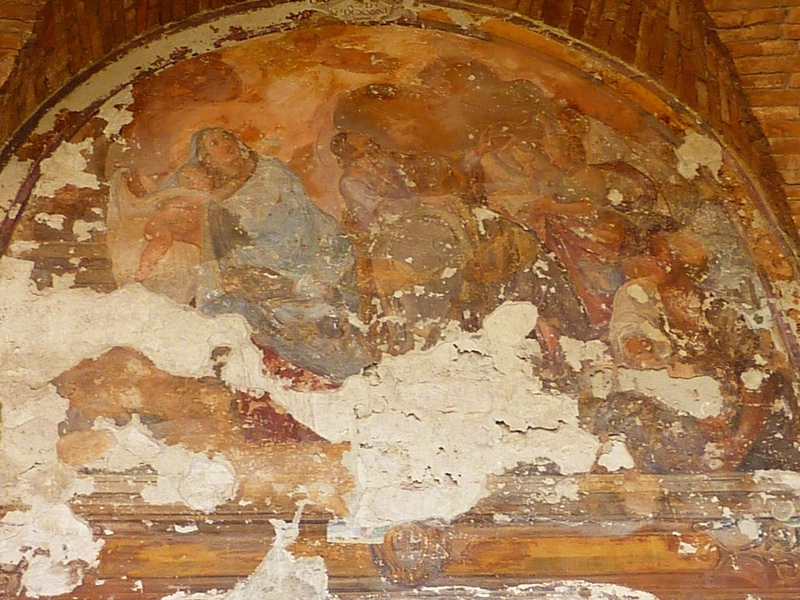 The distressed surfaces and broken colours recalled for me fresco surfaces that have faded or flaked off over the centuries. 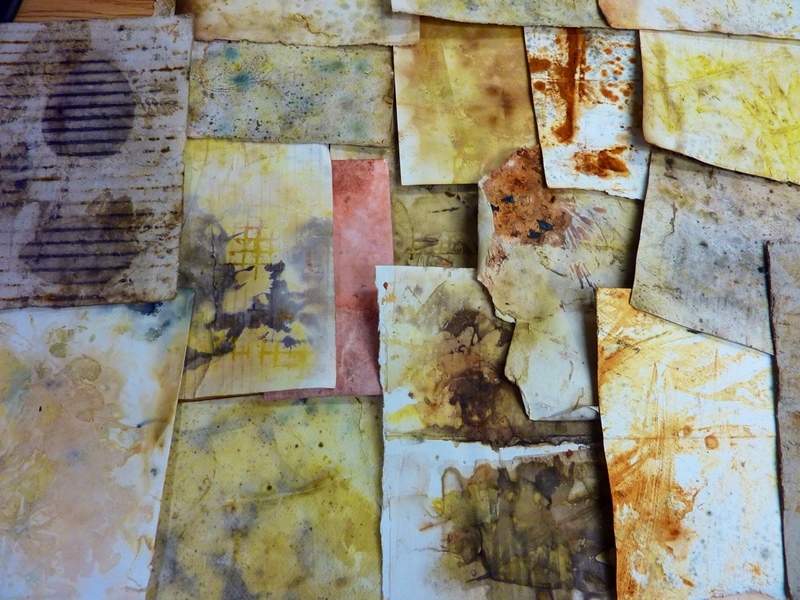 These papers will form the content of more work on that “distressed fresco” theme now that I am back in my home studio. 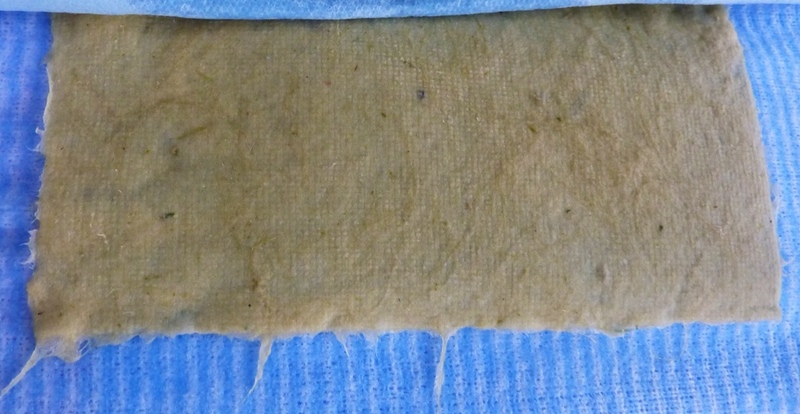 Paper stack barrier sheet: with leaked colour from maple and madder. 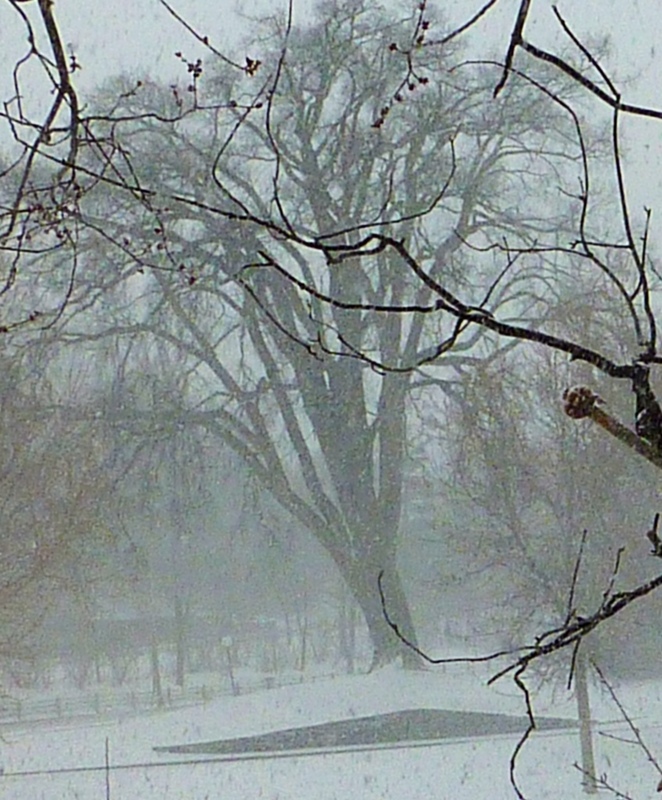 Not sure- maybe maple…Did not take good notes on that one! The blue is Dogwood berries. 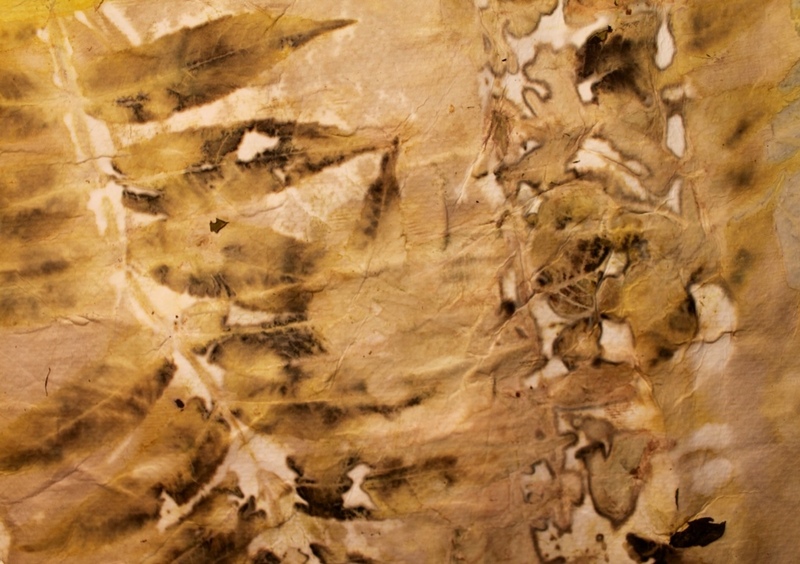 Collection: Maple, oak and vine leaves; blackened with iron liquor painted on, post printing. So mostly photos today showing my experiments with the regional plants of the Subasio. My printing setup is a tad on the ghetto side which is what I had predicted and had planned to cooperate with. 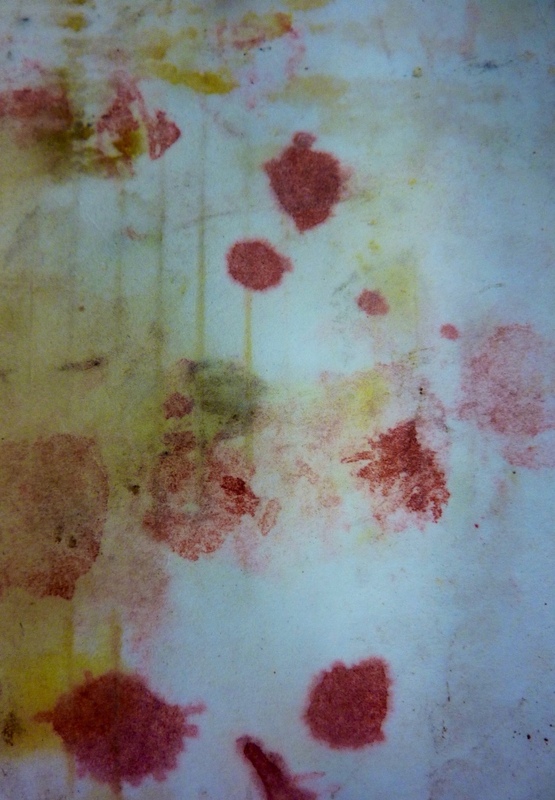 The first few prints had way too much steam puffed at them so came out rather watery. 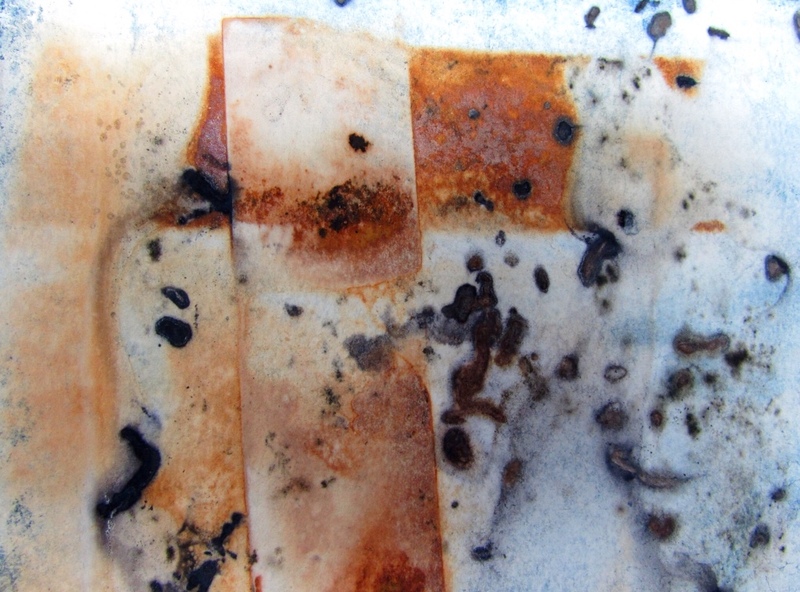 An iron wash (ferrous sulphate painted on the wimpy bits) brought out the lines and new colours. So far, I have obtained a multitude of yellows and not a few blues (from dogwood berries and blackberries) plus pinky purples from pomegranate seed juice. Browns, tans, rusts are coming along as the days of October draw closer to the end of the month and the leaves begin to turn colour. Good old cotinus gave a tad of blue, too! 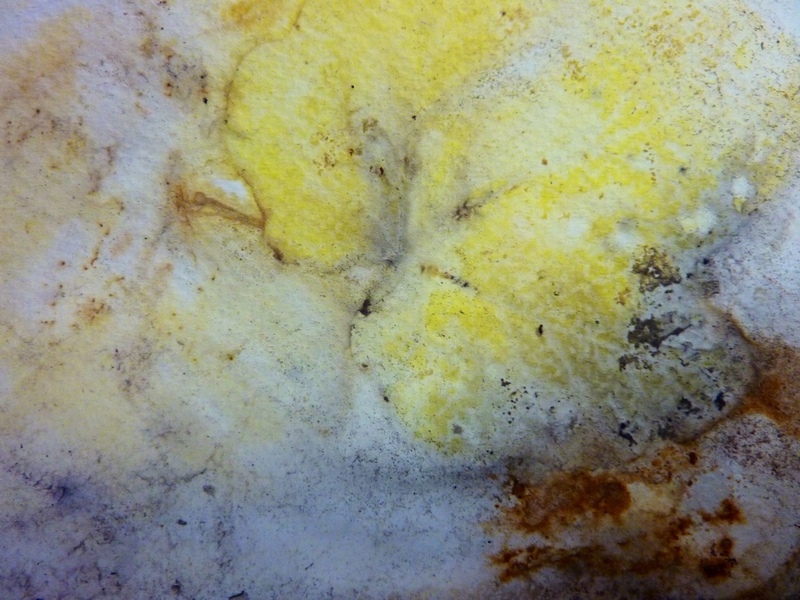 Random print: blue from dogwood berries, yellows from the leaves, browns too. 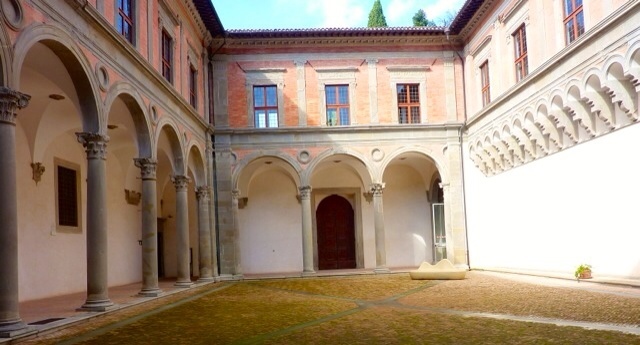 The statement above about my work during my residency at Arte Studio Ginestrelle appears in the catalogue for the show of contemporary art at the public art gallery of Assisi. The show takes place the last week of November. 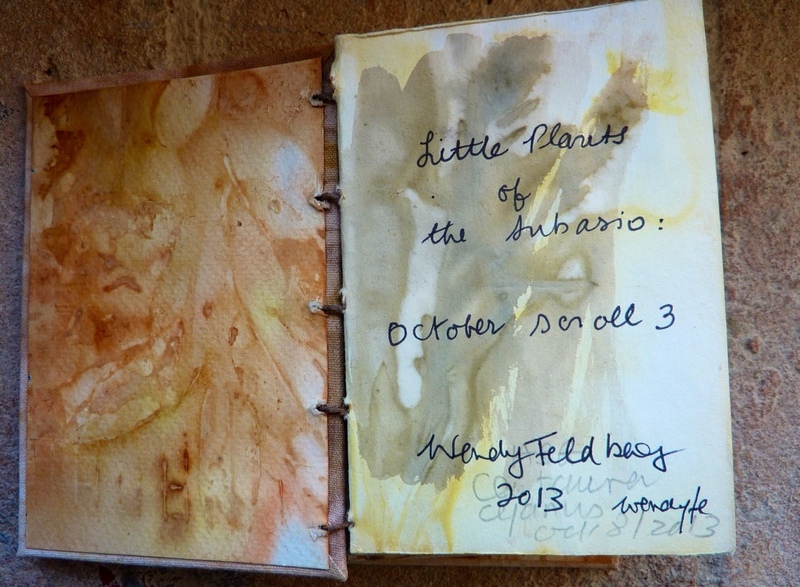 As well as the inspiration I found so abundantly in and around Mount Subasio, I am pleased to share with you some of the Artist Books and textiles created during my October 2013 residency and featured in the annual exhibit by many of the Artists In Residence. 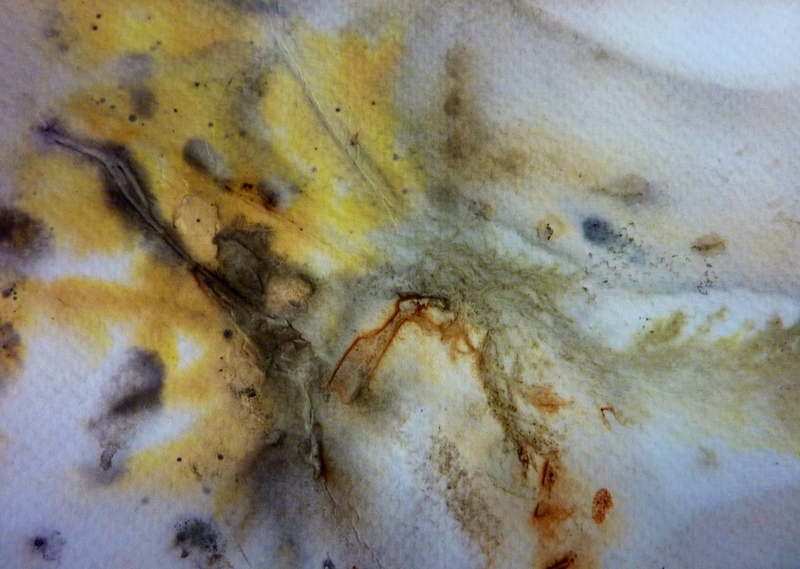 I have also brought home with me many eco printed papers and textiles that will form much of my work later in the winter. First pic: Umbrian handwoven linen, highly textured and serviceable cloth; an Assisi-fleamarket find, vintage but never used. 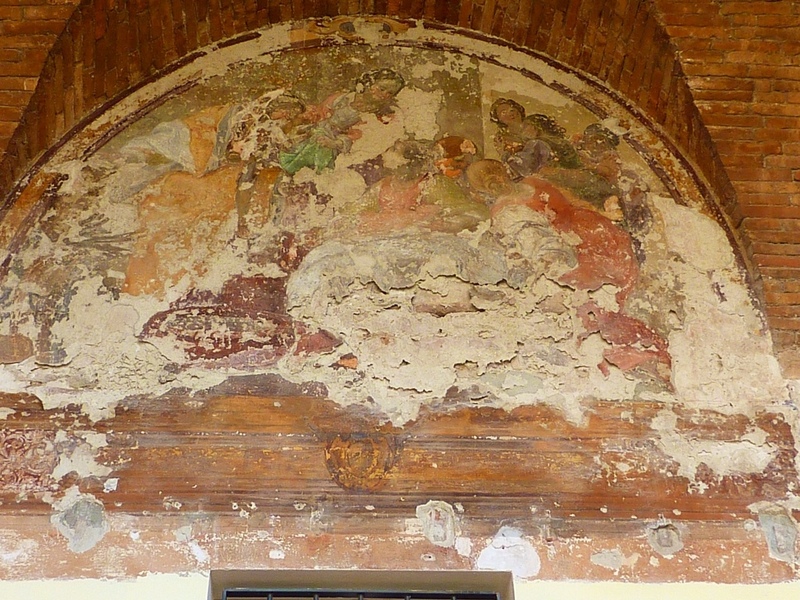 It took me many prep and printing sessions with mordants and local plants to express the Giotto/Cimabue/Pintoricchio fresco colours I had in mind. 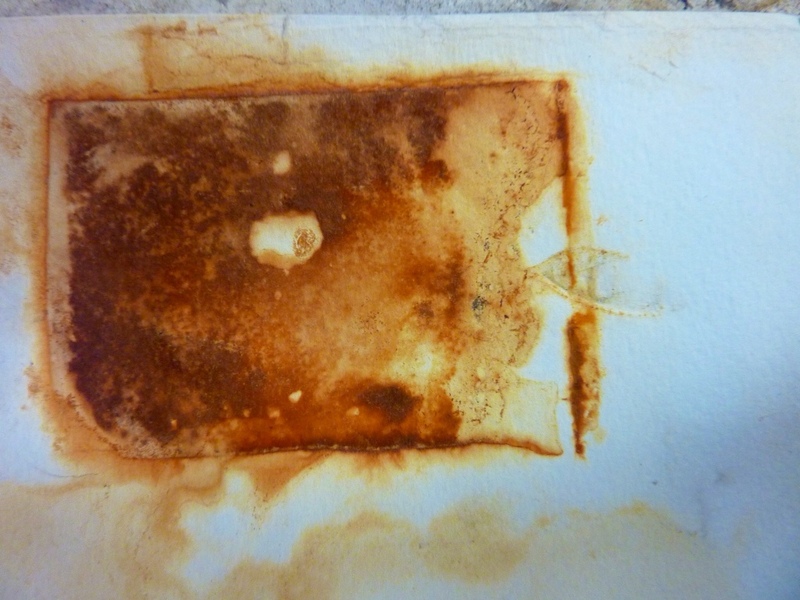 Even then, I used madder dye powder for the reds since Rubia tinctorum does not grow at almost 1000 metres above sea level where the Studio is located. The abundance of yellows in the earlyOctober leaves was a challenge. 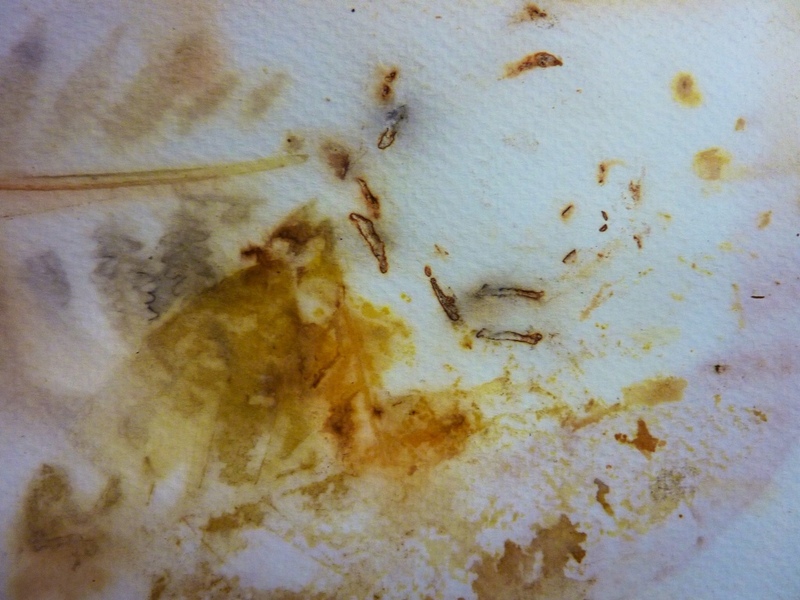 During my first week of printings, shades of yellow or brown was all I could manage to obtain using a basic alum acetate mordant. Hmm. 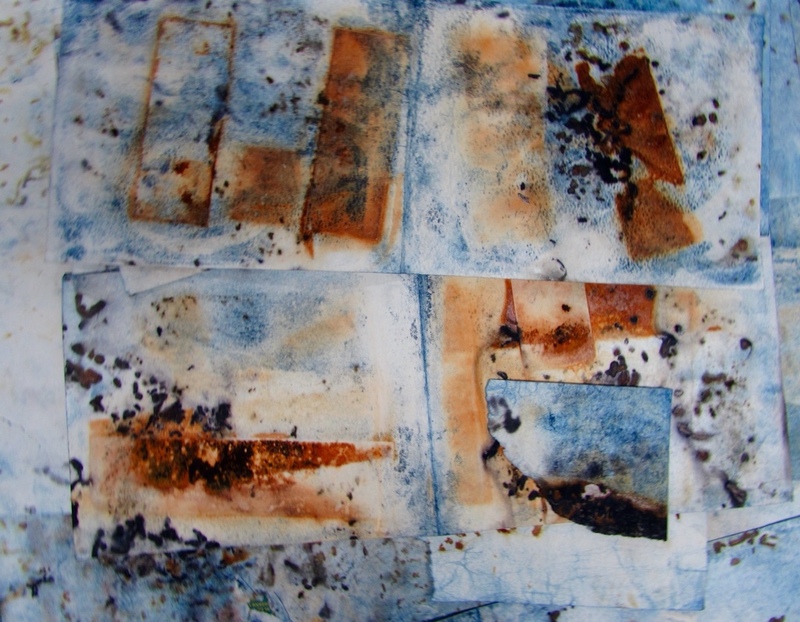 I knew I would print the papers and cloth several times again for more colour and form. 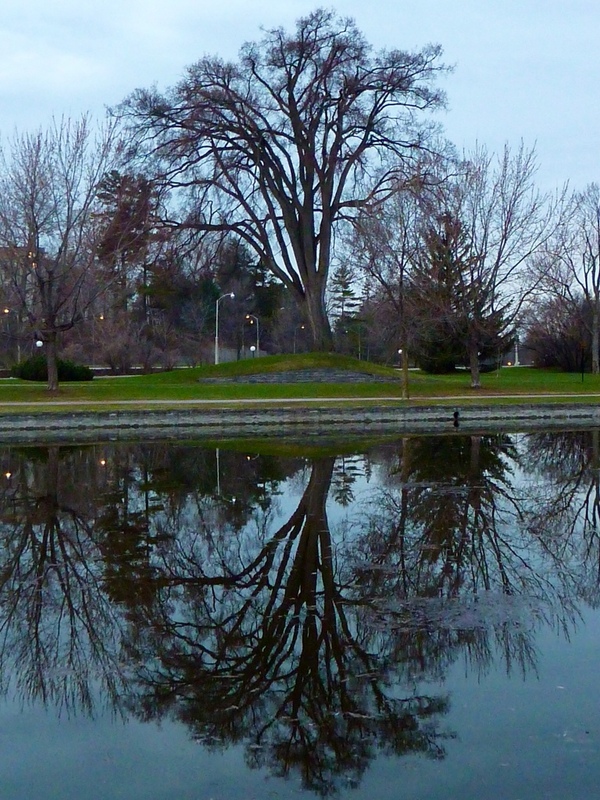 As the October days passed, the fall colours began to change and pigments both increased and decreased in the leaves. I searched for sources of blue and found them in Dogwood berries (Cornus sanguinea), Sloes (Prunus espinosa – tiny plums) and Cotinus coggygria (more blue after the middle of October). 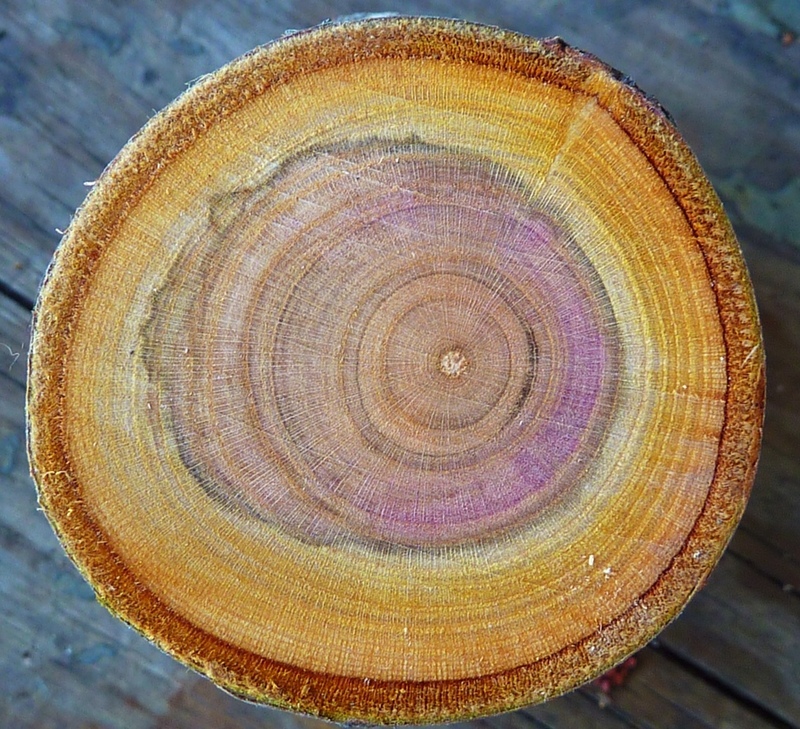 Purple showed in the bark of walnut twigs (Juglans regia) as well as late blackberries (Rubus fruticosus) and sloes; greens from Dogwood leaves (and berries, too); moss greens from Rosa canina (Dog Rose). 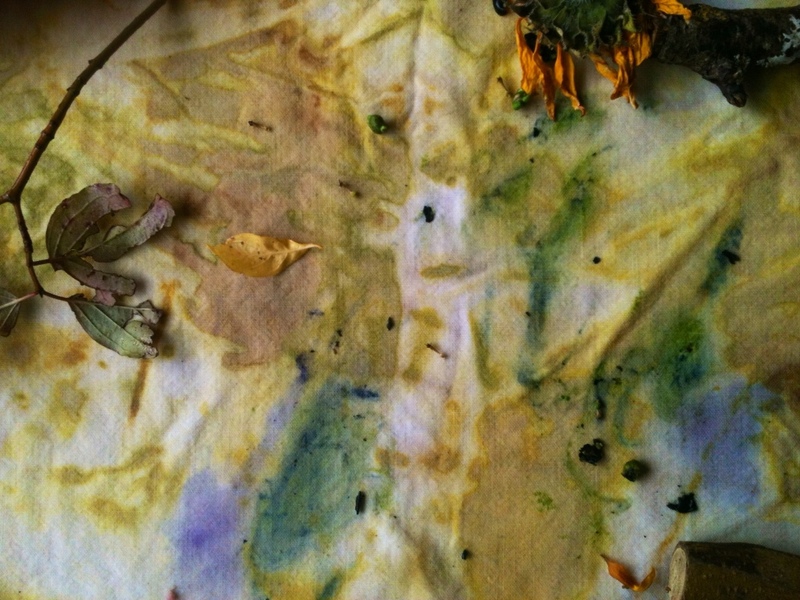 The yellows were varied: Golden-apricot from Olive leaves; deep golden from Walnut; yellow-chartreuse from Sumac. The “ginestrelle” or Dyer's Broom (Cytisus scoparius in these parts) had only seed pods for printing tannin browns in October, its brilliant yellow blooms long gone. 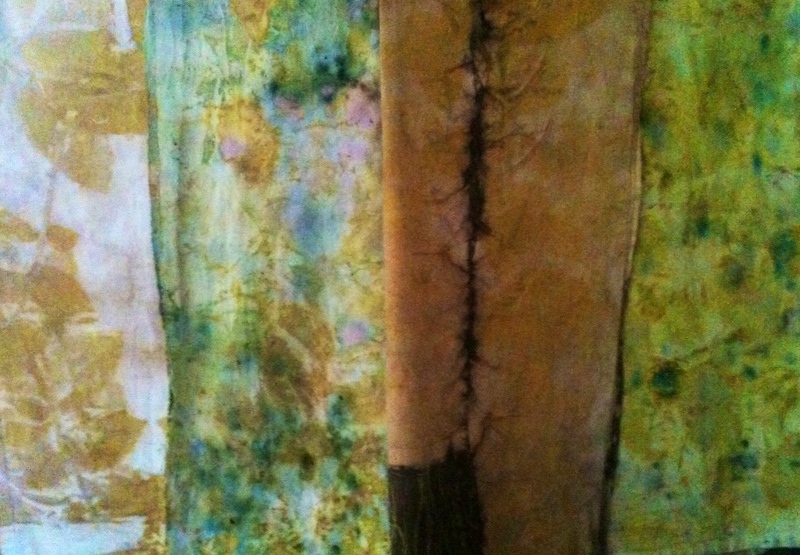 Dogwood greens, walnut yellows and deep browns; pinks and purple-pink from walnut twig bark. 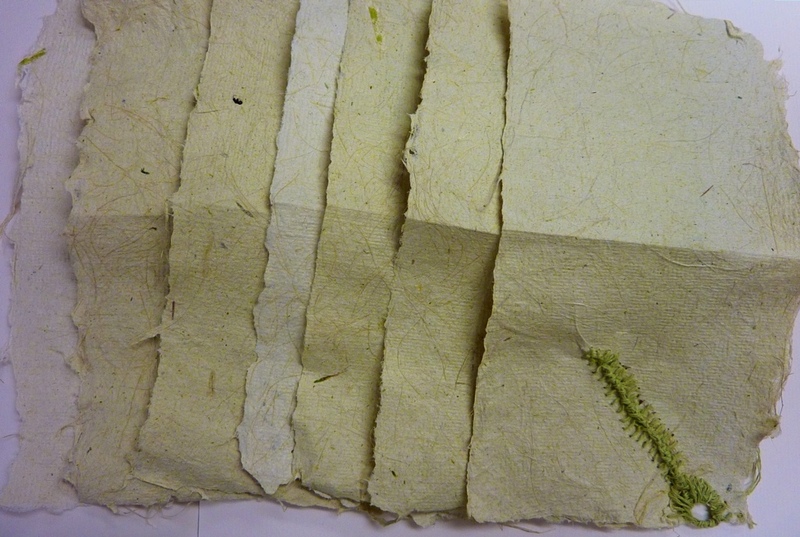 With the Subasio Scroll Collection I am continuing to develop an earlier goal: to use the accordion book form as a botanical scroll. This collection of three books is entilted “Little Plants of the Subasio: October Scroll” (1, 2, 3). 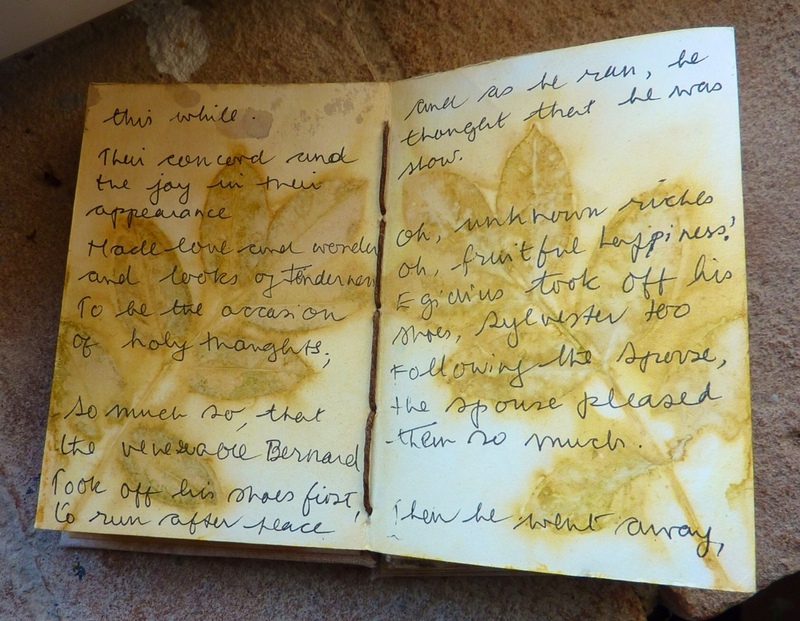 A fourth book is coptic-bound and contains my handwritten copies of sayings from Dante and Francis of Assisi. The book is also entitled “Little Plants of the Subasio”. 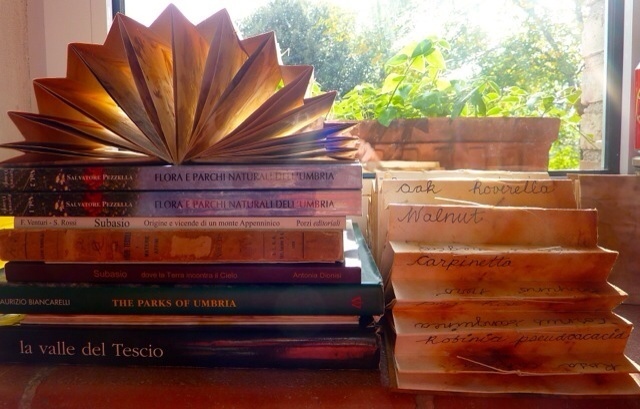 Each page of each book, back and front, is printed with leaves, bark and/or berries and fruits of the area around Arte Studio Ginestrelle, which is llocated nearly at the top of this part of the Subasio. 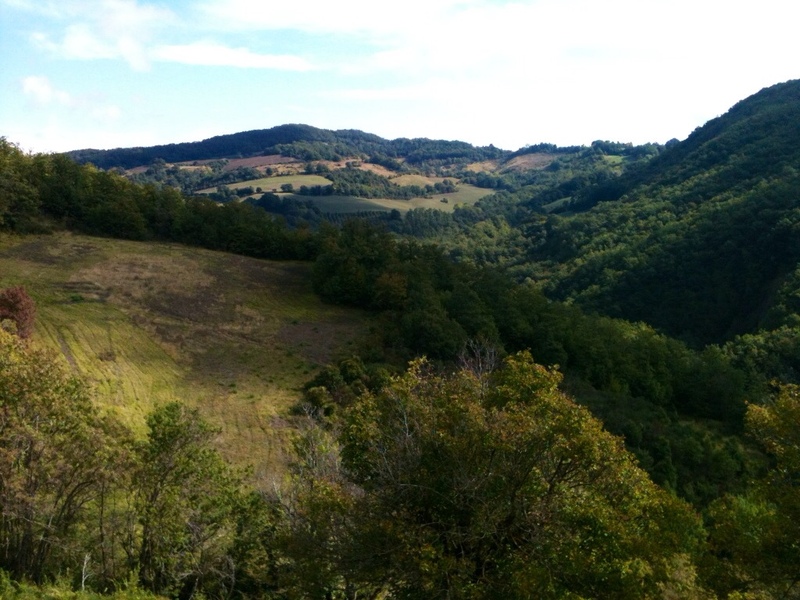 The range of available plants changes with the altitude (here, between 800 and 1000m.) So while madder might be found on the bottom layer of the vegetation belt, only a relative (Galium lucidum, but not a red one! ) 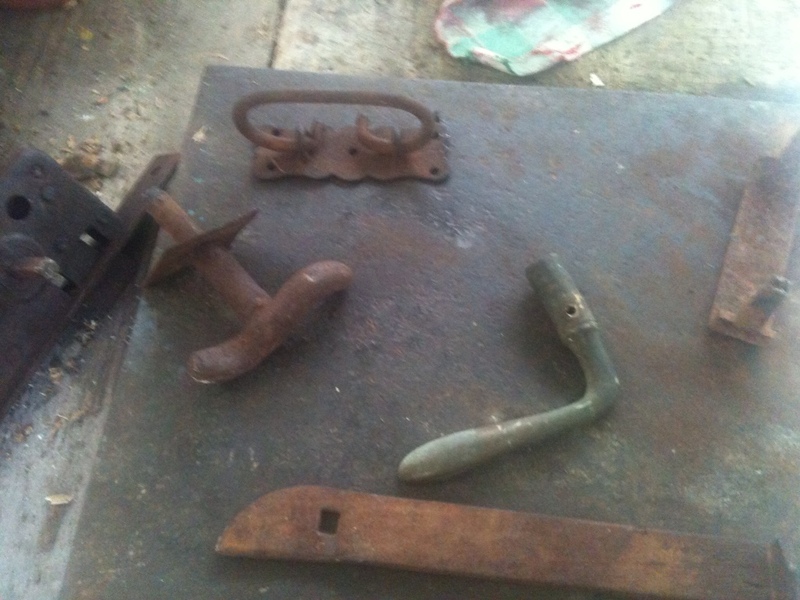 was found at the mid-to-high level where the Studio is. My aim was to use only what I could forage within that vegetation layer on the mountain and therefore not to import plants from other areas. 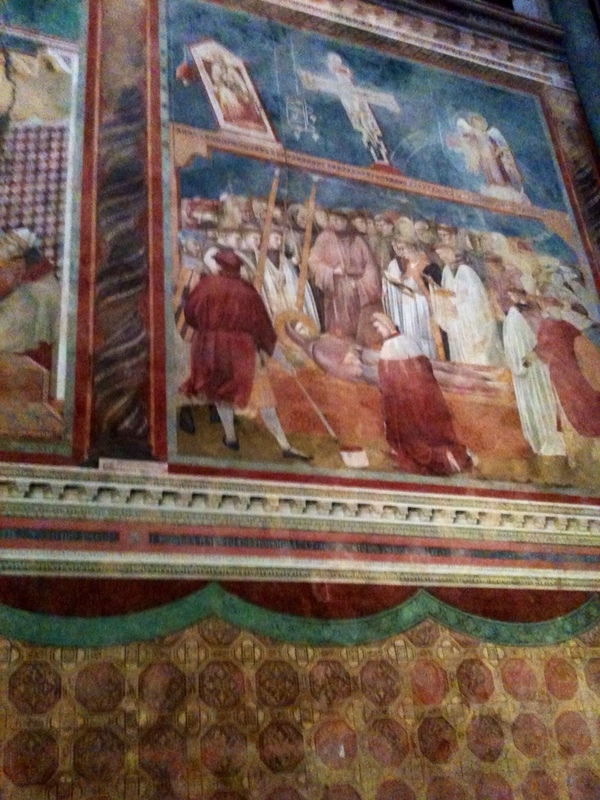 I did succeed in that aim, except for my use of powdered madder…one cannot express the spirit of Giotto's frescos without red! All the other plant colours came from the vegetation right at hand. 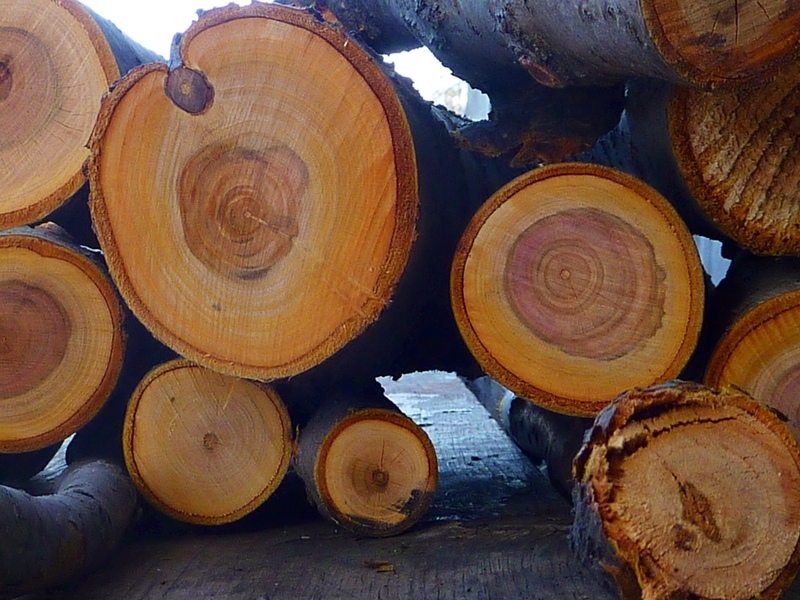 Some of my main pigment sources were: Juglans regia, Cornus sanguinea, Rubus fruticosus, Prunus espinosa, Robinia pseudoacacia (invasive, introduced), Carpino nero, Quercus robur, “Rutacae” – species unknown except for the family relationship), Sambucus negra, Rosa canina, Acer opalus, plus Olive and Grape. My “Subasio October Scrolls” collection of Artist Books consists so far of three accordion-spined and one coptic-bound book. 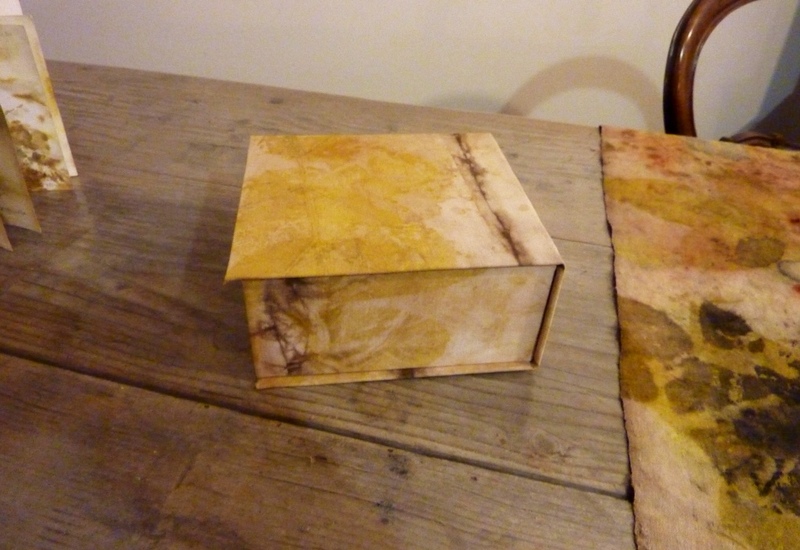 ( Covers and Book Box were made by Shlomo Feldberg using my printed textiles and papers.) 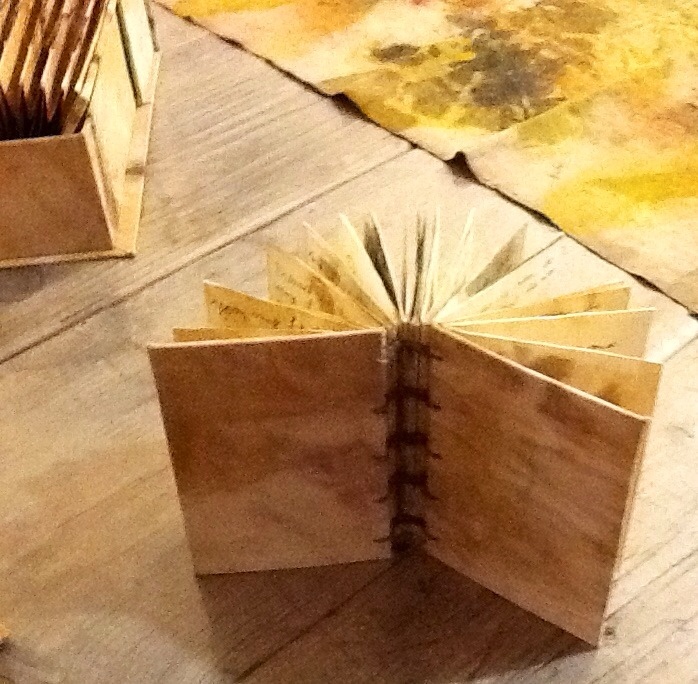 These Artist Books remain in Assisi for exhibition. 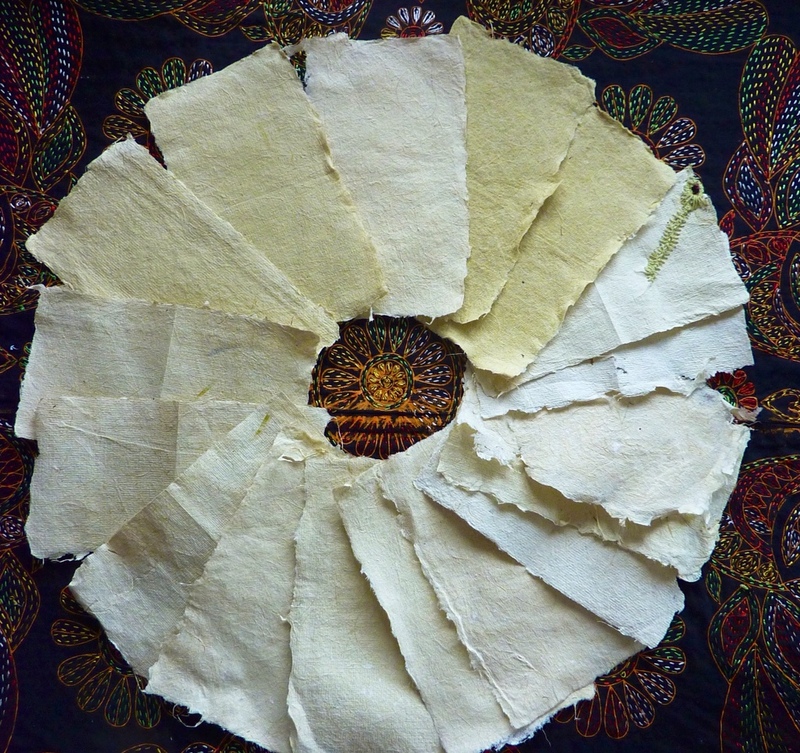 Others will be added to the collection in time as I continue to work with the many papers and textiles I made there and brought home. Completed scrolls atop the reference books I used to help me identify the native and local plants. 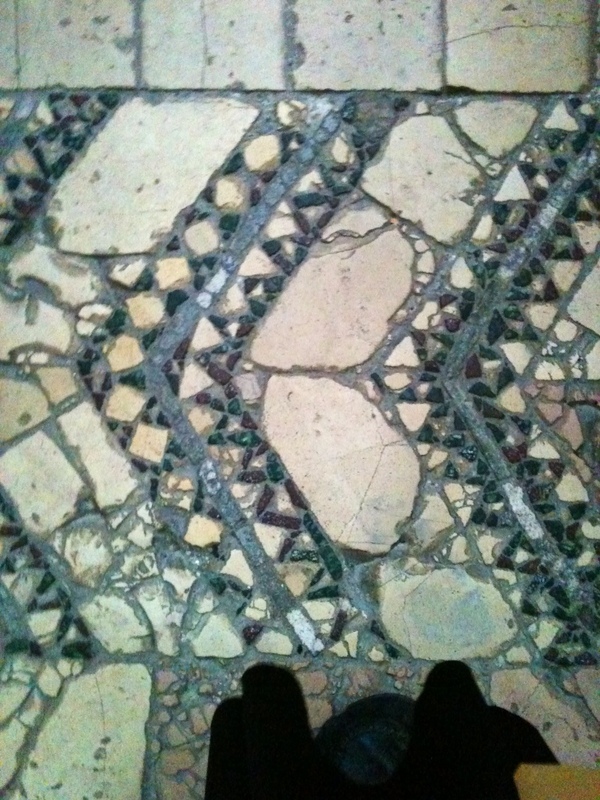 I had hope they could tell me which might be for use as sources of pigment. 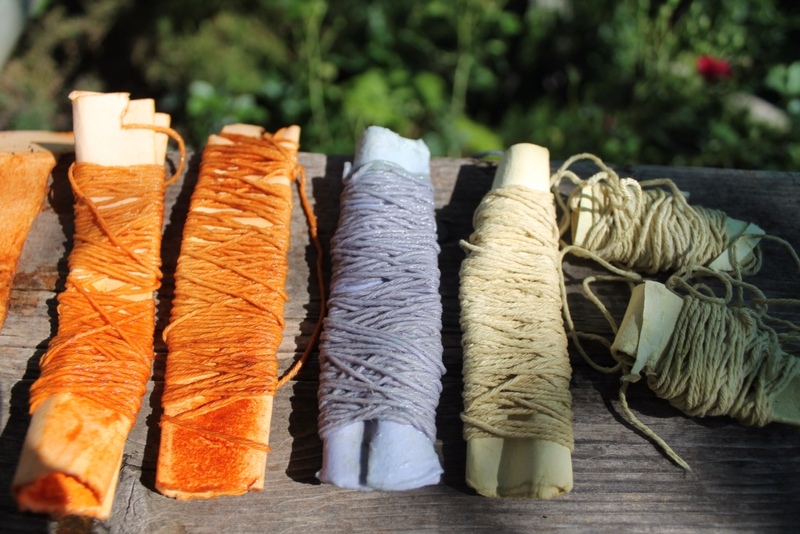 None of these books discussed the traditional dye uses of the plants, even when they gave extensive info about medicinal use. 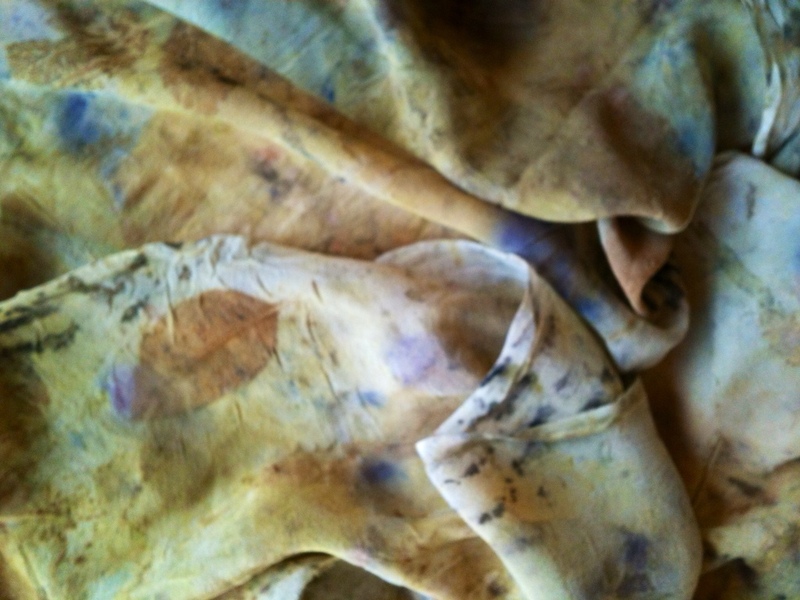 This confirmed my supposition that natural dye knowledge about the area was limited or non-existent. 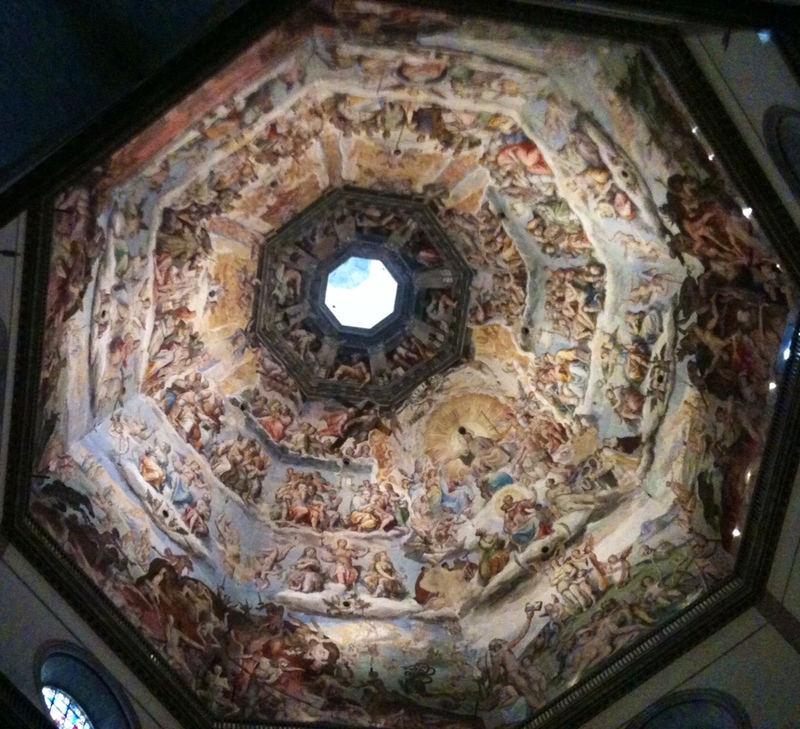 Dante, Canto IX. 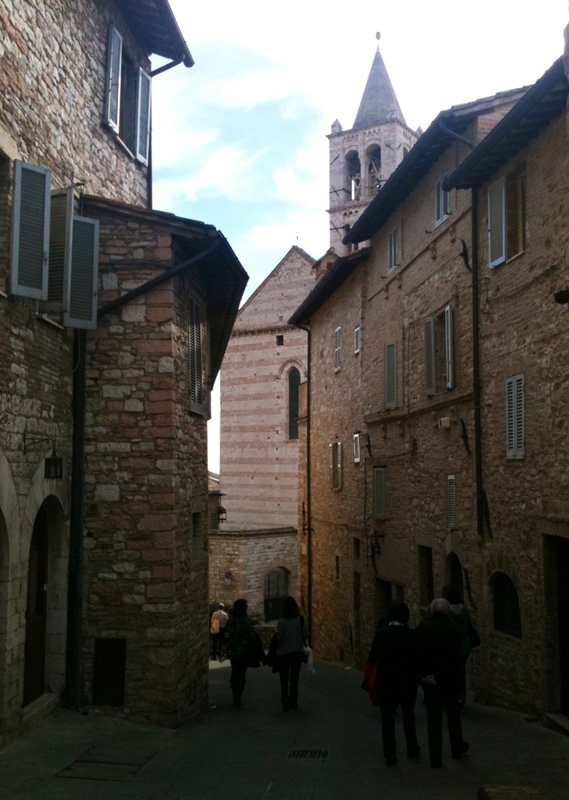 Mount Subasio and some prayer-poems by Francis of Assisi. I leave you today with a promise to post more pics and info when (a) I have sorted and retrieved some lost photos (FB crashed iPhoto and ate my camera upload…lost a LOT of pics!!!) and (b) after we have moved to our new house next week. More pics next time! 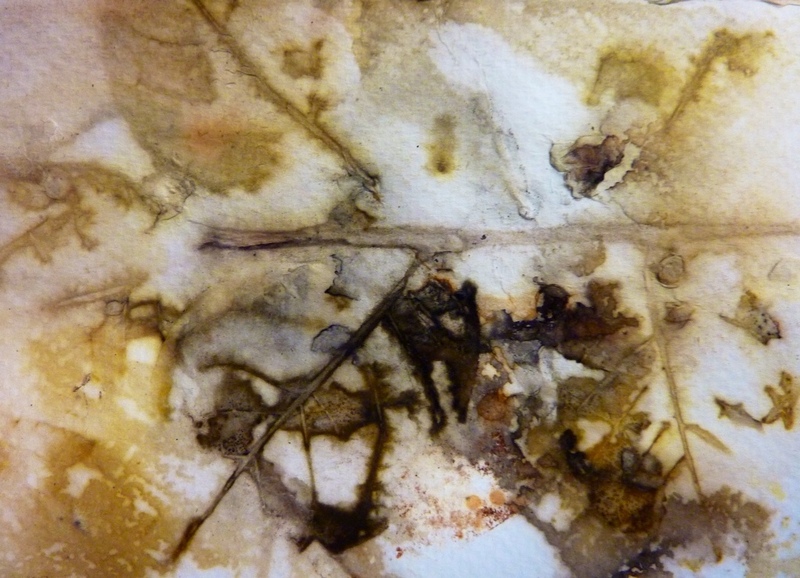 Leaf prints for book pages, inspiration photos…and photos of the Studio and environs. Best to you, dear Reader. 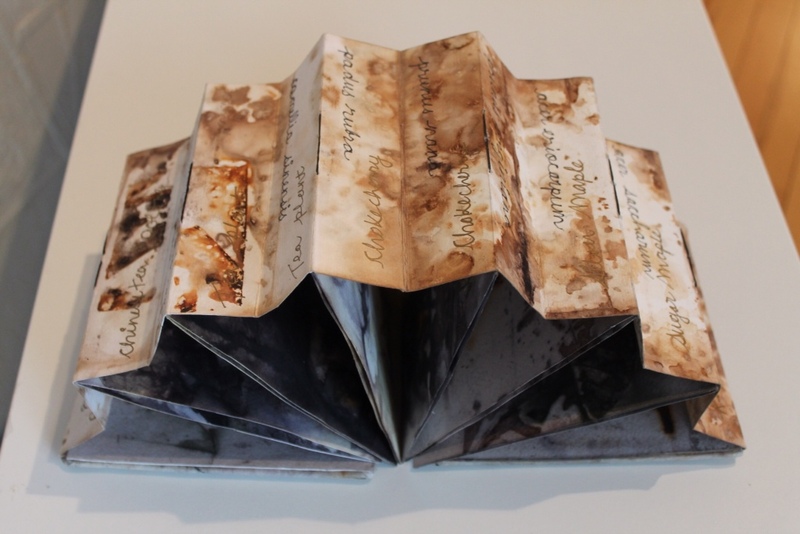 First, some pics of my Artist Book “Botanica: New World Scroll” referred to in my previouscpost. 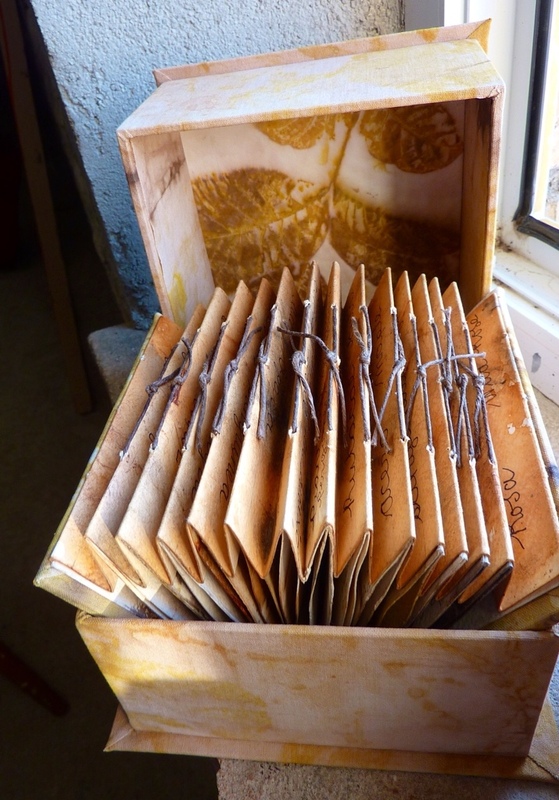 The tutorial I published here some minutes ago gives instructions for making a book like this. The July issue of Somerset Studio magazine has published my article on how to make this book. That is great! 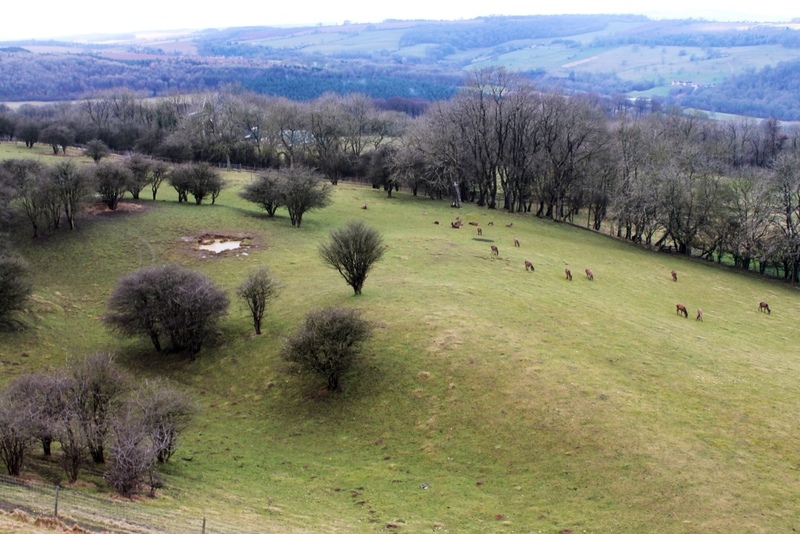 But Because of some editorial errors and wishing to correct the info for readers, I have published my unedited article here for readers' benefit – as well as to relieve my own anxiety. See previous post! 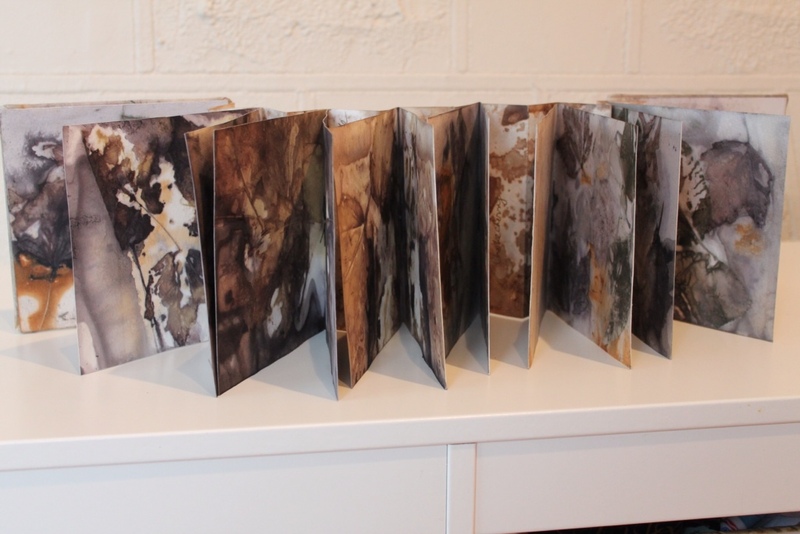 This book will be in the show of work by the Canadian Book Artists and Bookbinders Guild held in Calgary later in July at the University of Calgary. And speaking of Calgary prayers and hugs go to my blog buddy arlee barr of Calgary who lost so much especially her studio. Now a return to the Iris Adventure, El Camino de Las Irises ( forgive the rusty Spanish). 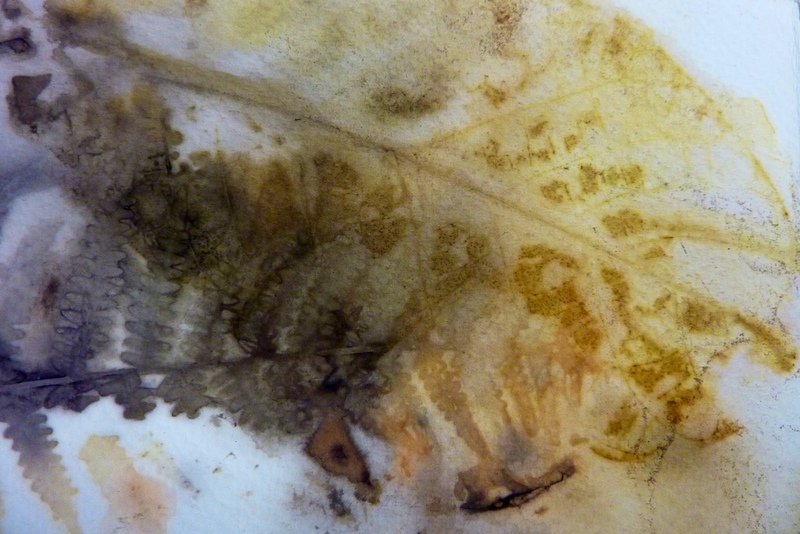 Guessing that blooms were not the only source of colour in iris, I decided to cook up some iris leaves to see if I could obtain both paper and pigment. 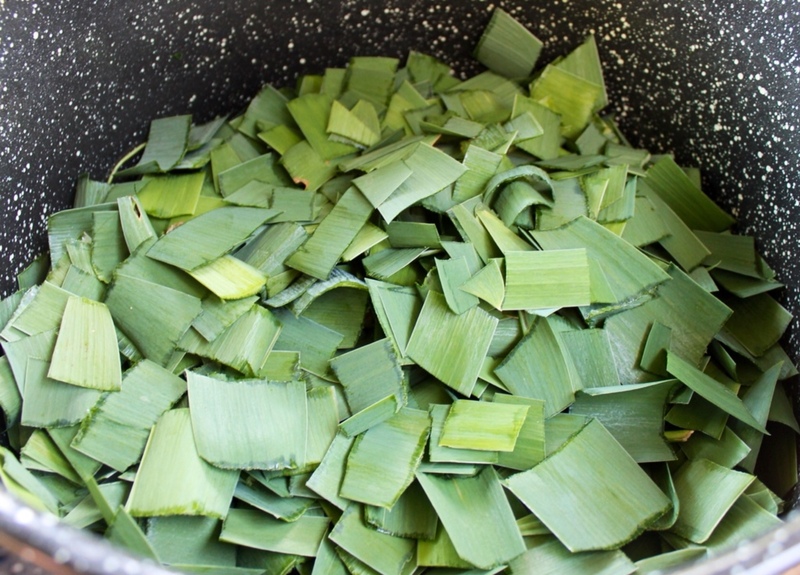 In water to cover and a cup of soda ash, the cut-up iris leaves (post-bloom period) were soaked overnight, then simmered at 180 for three hours in a large granite canning vessel. 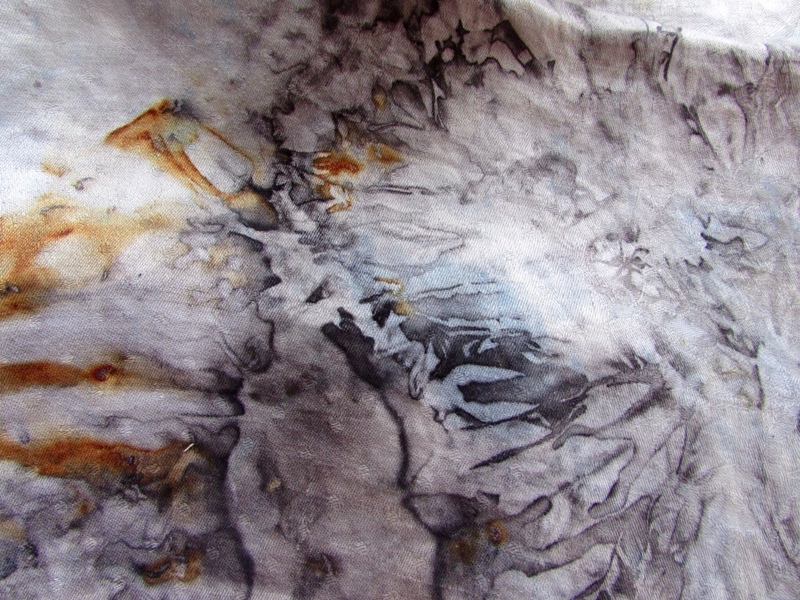 Into pot also went a few lengths of alum-mordanted habotai, a bit of cotton, some vintage linen. 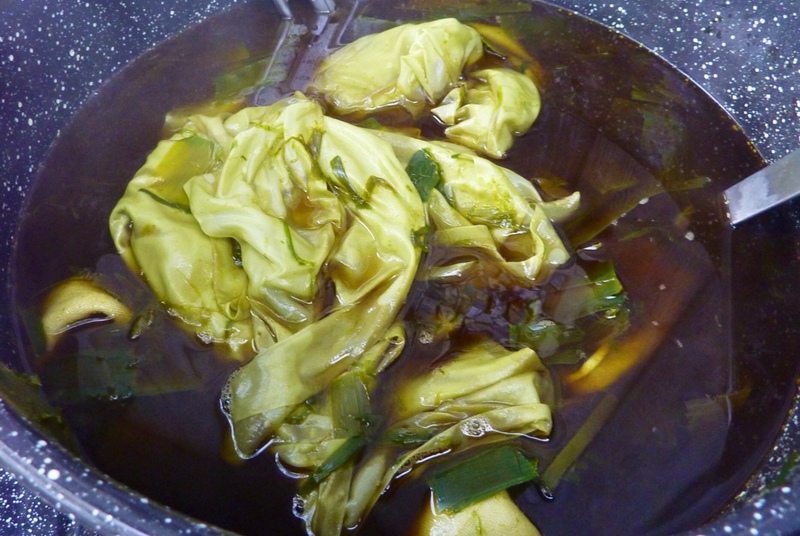 Plants and fabric were simmered an hour together and left overnight. 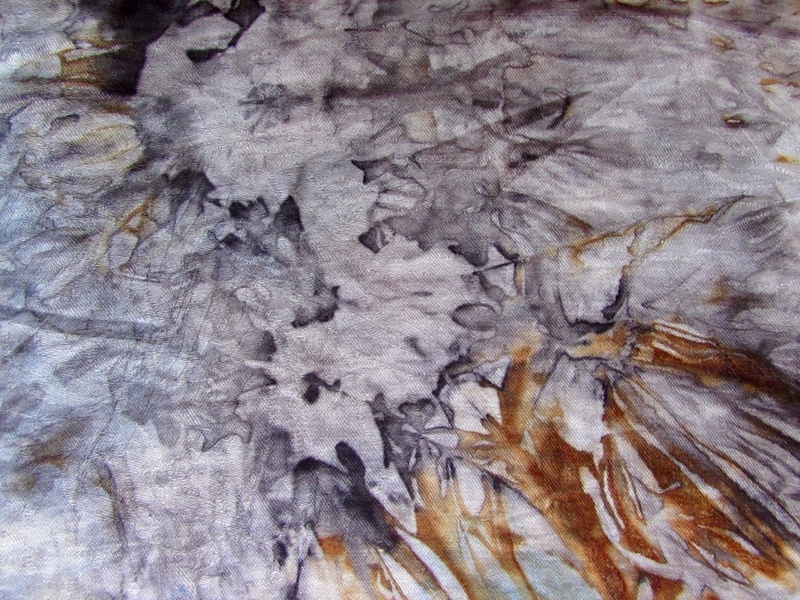 The familiar soft iris green developed on the fabric in the pot but turned a neutral “greenge” when dry. Time to get out the dye assistants. 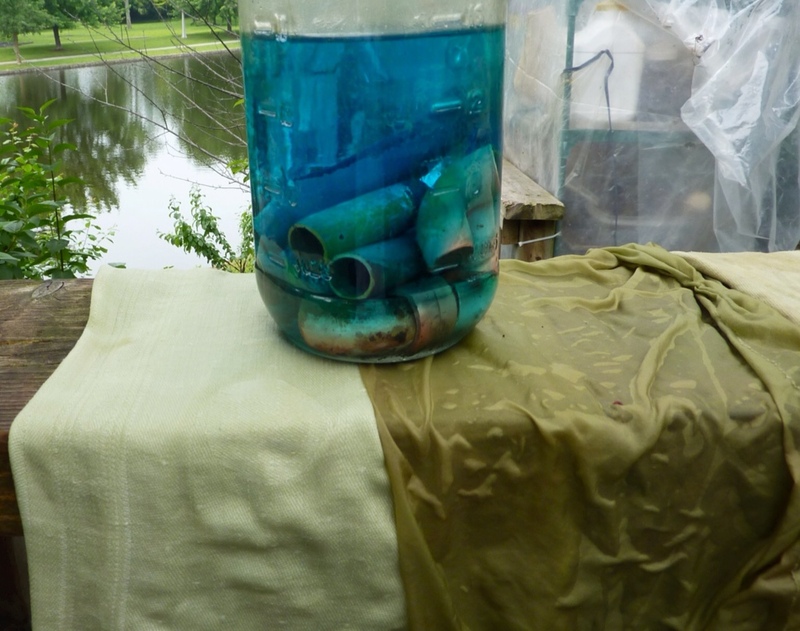 Copper sulphate (home made, vinegar on copper pipe) can shift colours towards greens. Indeed it did, but much more strongly on silk (R) than on linen (L). 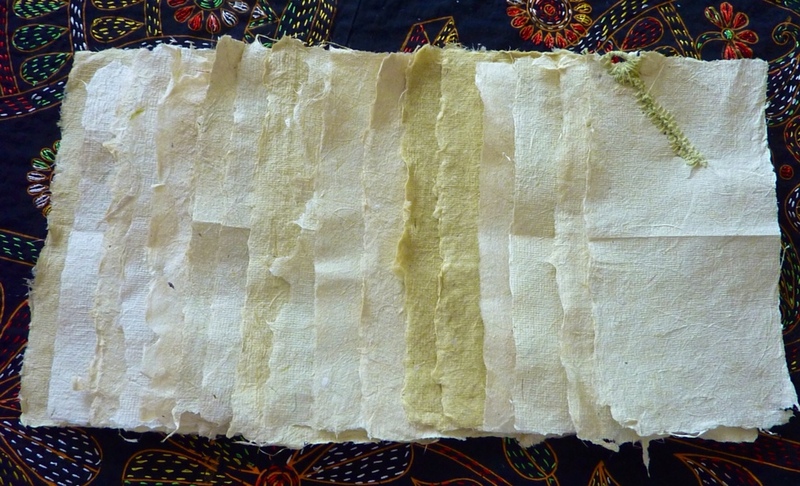 After dyeing the fabric in the pot with iris leaves, I set about making paper from the leaf fibres. I was pretty sure by then that any paper made from iris leaves would be green. 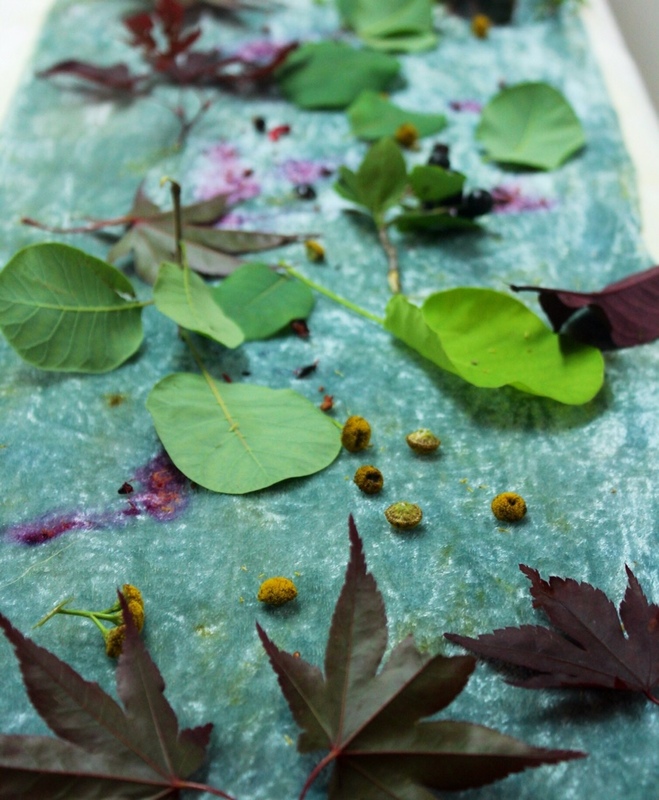 I have made paper in a class situation before but never from my own garden plants. 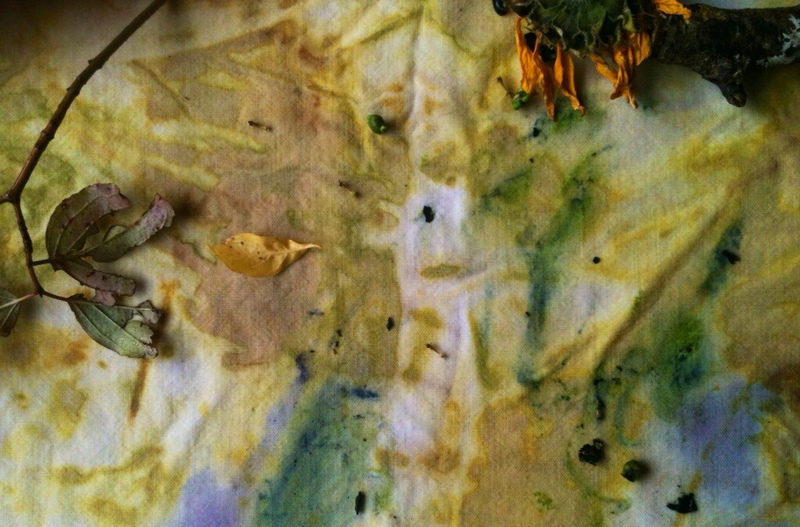 My aim was to produce handmade iris leaf paper to use in an Artist Book about irises and pigments. 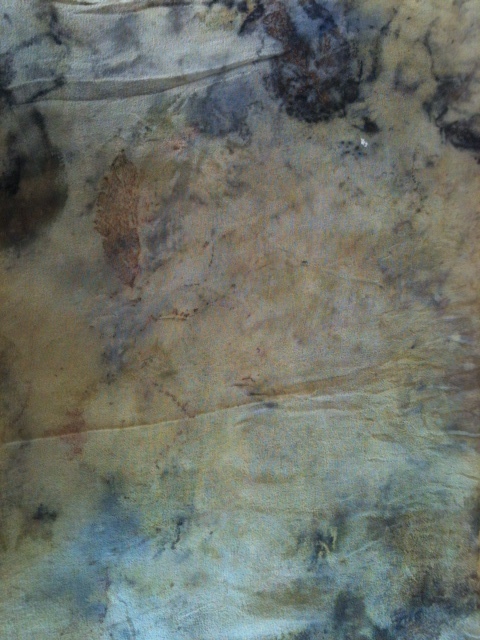 Here is the first sheet, handpulled and a soft green (but not such good colour in the photo). 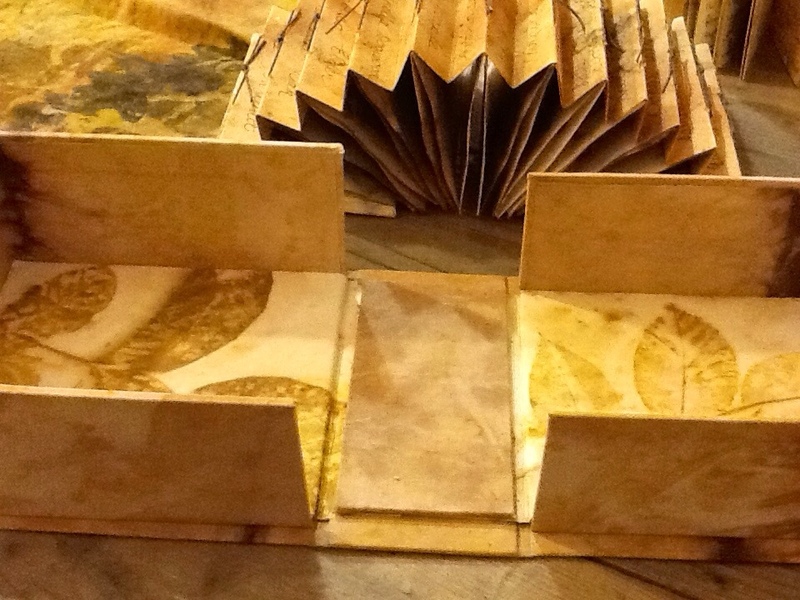 Husband made me a mold and deckle from scrap wood and window screen fabric, 4″ x 8″, a good size for pages in a small book. 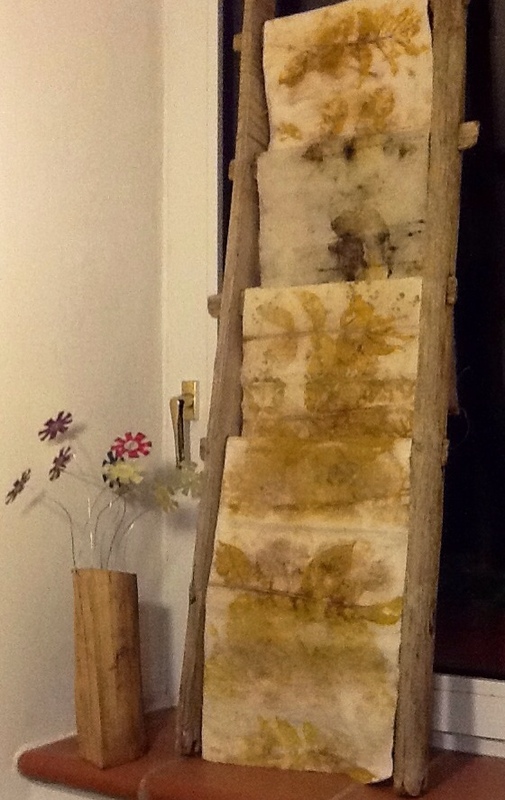 I followed the usual papermaking steps: cooking the plants, straining them, rinsing the fibres well, squeezing out as much water as possible, separating the fibres into wee bundles, processing handfuls of plant fibres in a blender, mixing the iris fibre with newsprint (unprinted) pulp in the vat, pulling the pulp up on the mold to make a sheet, couching the sheets in a stack, pressing and drying the sheets. 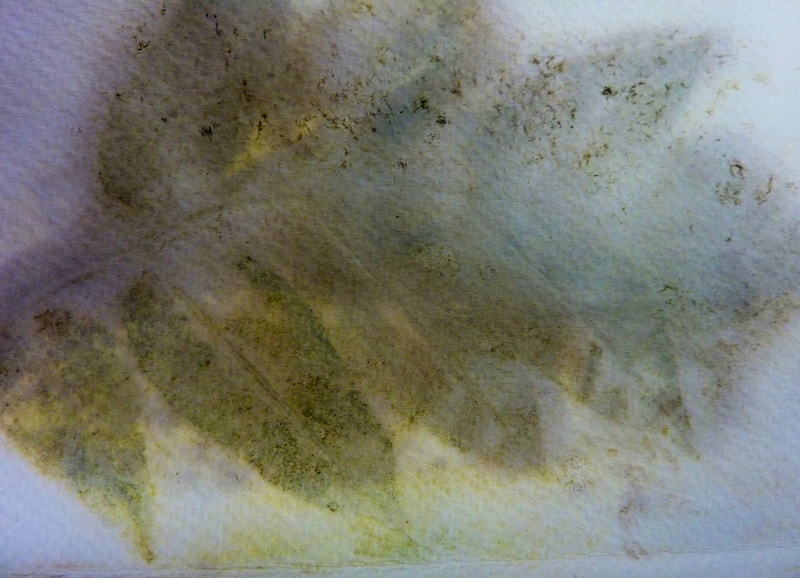 I made 17 – 4″ x 8″ sheets from my pot of iris leaves, some thicker than others. 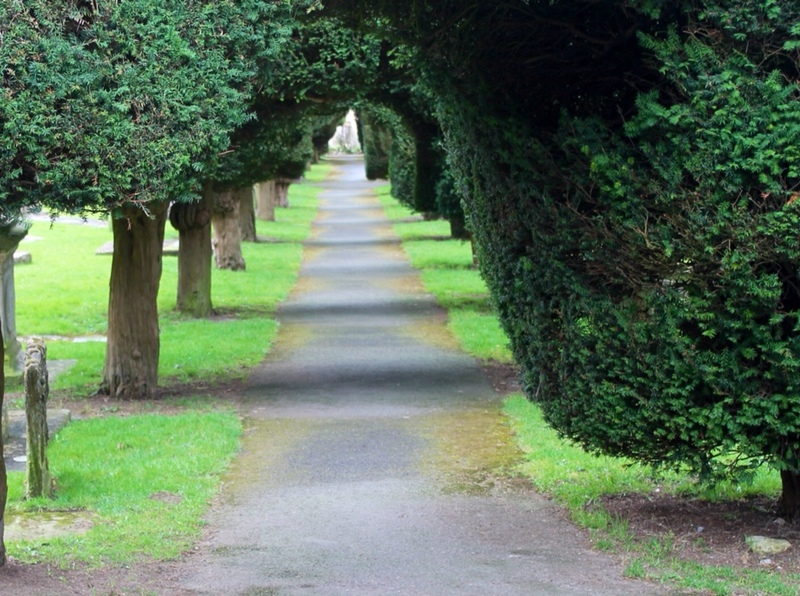 The thicker, the greener. 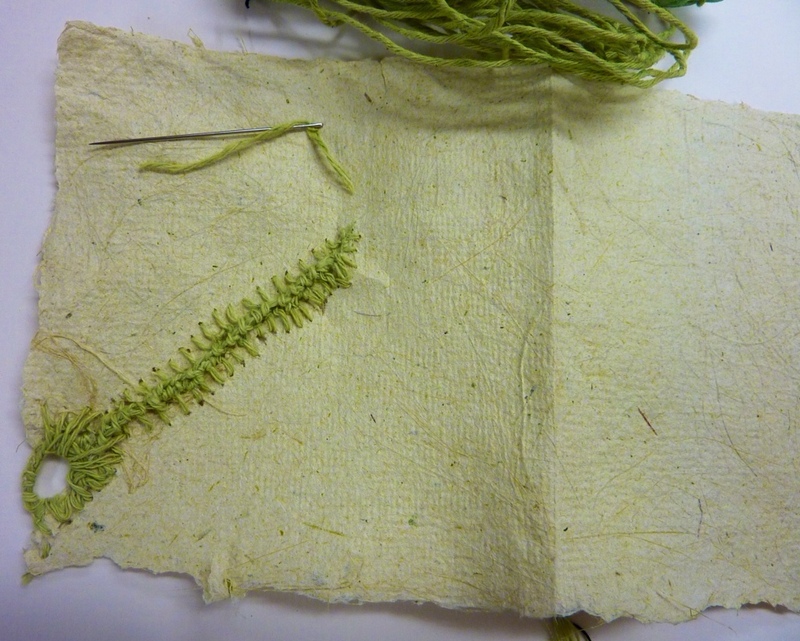 The thread I used for reparing the breach in the paper was cheap cotton string, solar dyed in green iris ink made from blue blooms. 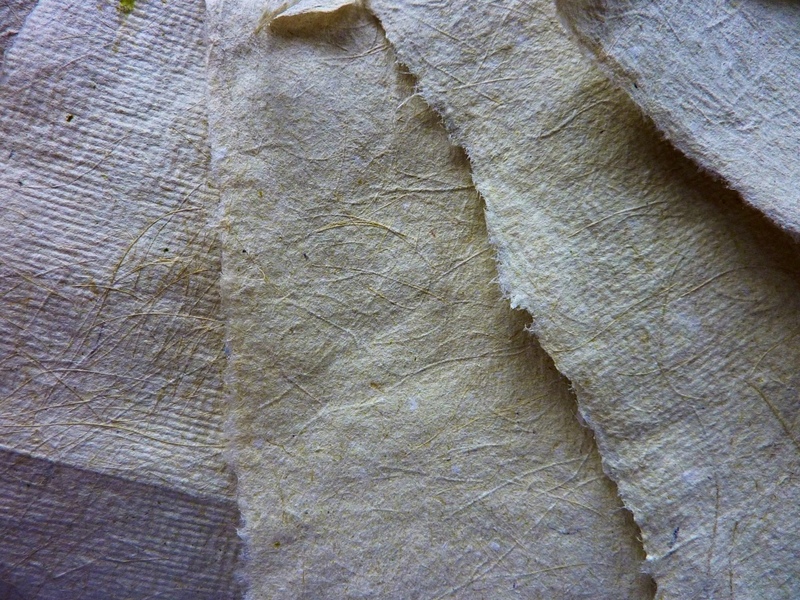 Waxing with beeswax made the cheapo cotton very much easier to work with. I was trying to work with comes to hand, like cheap string. 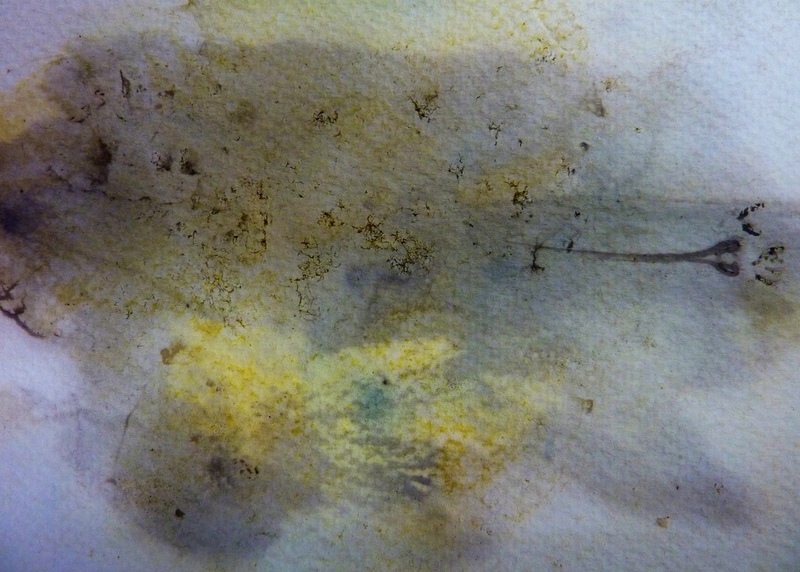 Below, you see the different textures imprinted on the papers as they dried on J Cloths and Shop Towels; plus you can see the long iris fibres. 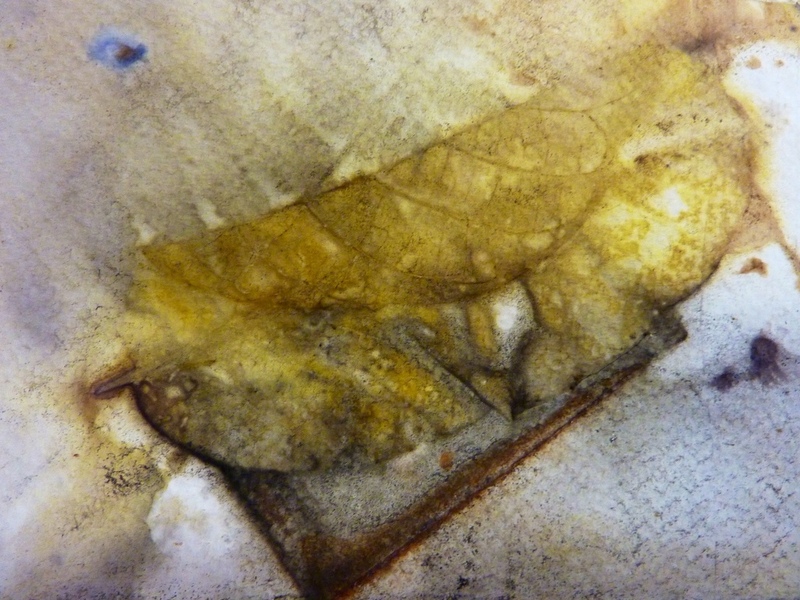 Some of the papers have bits of green leaf embedded. 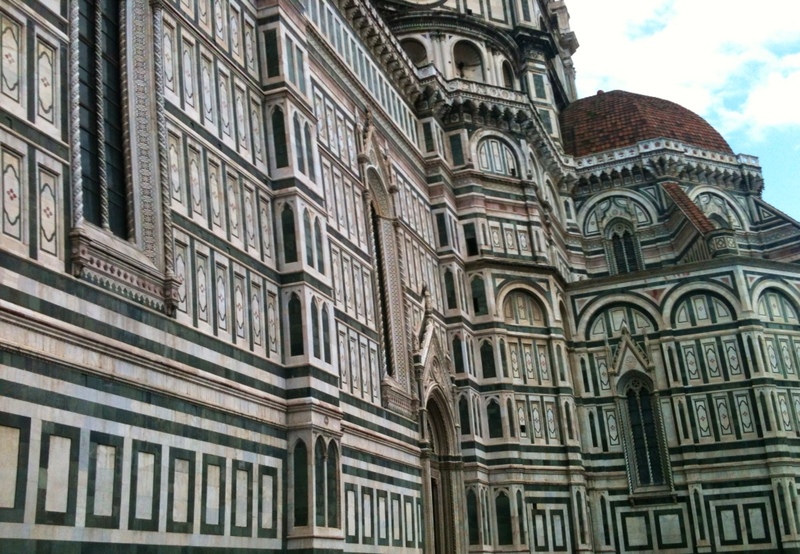 Poor colour reproduction here, though – they hardly look green at all! They sorta look like home made crackers. I do enjoy the deckled edges! 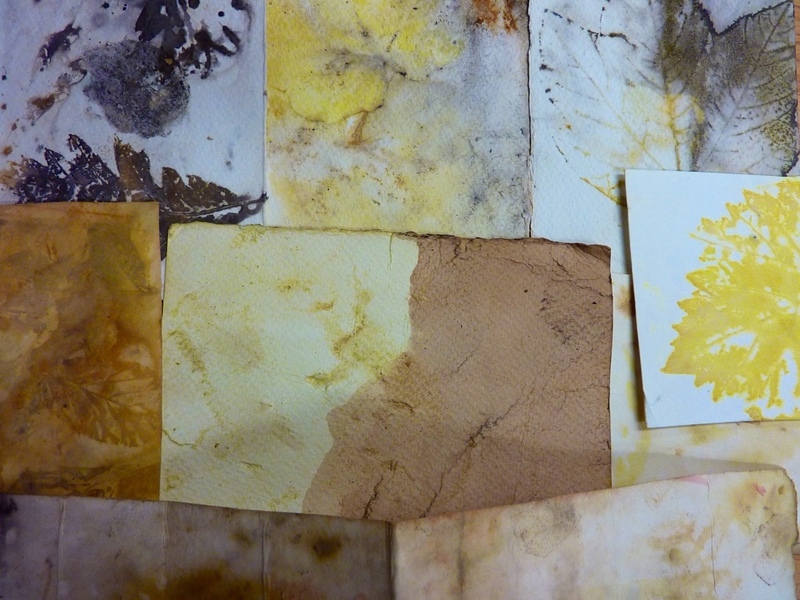 Next time: The Iris Book: with iris flower eco prints and iris leaf papers. This turned out to be serious Eye Candy for me! 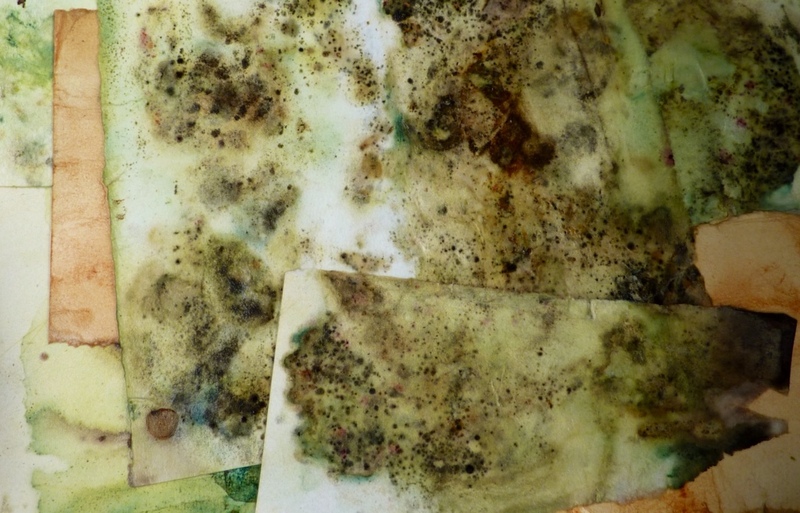 After July 6, reports on soil pigments plus comments on my class on Renaissance pigments and using the iris “clothlet” as a source of green pigment for painting. Happy Canada Day July 1 and Happy Fourth Of July this week to all! Friends return – the Scilla is among the first. 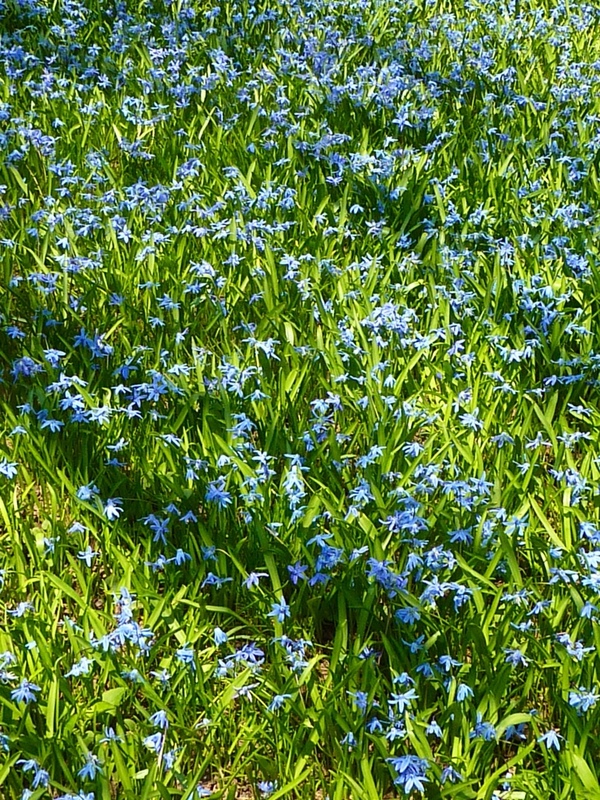 Scilla will print blue, like bluebells or hyacinths. Amazing colours! 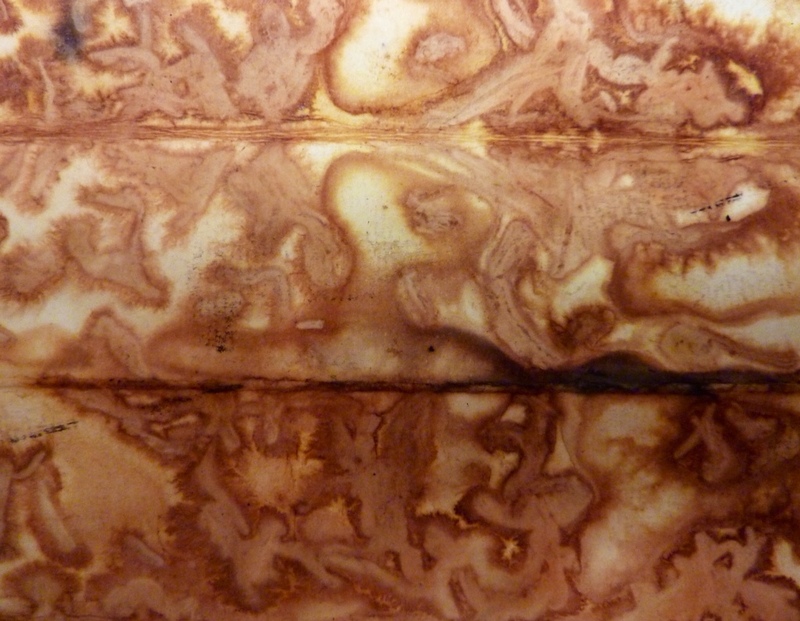 Bark and wood dyes this spring, clearly. And prunings from the Concord grape. 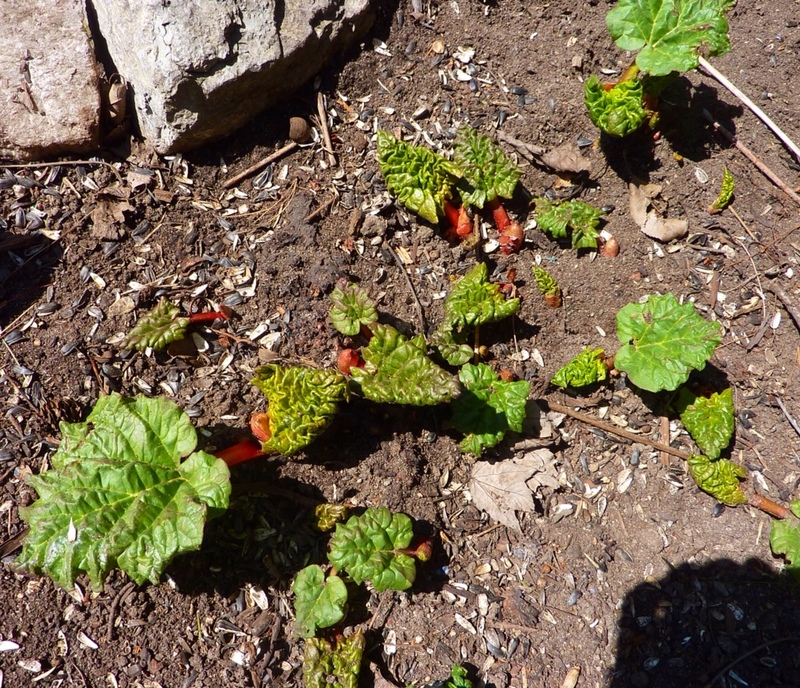 Rhubarb leaves are a traditional mordant for cellulose fibres but are poisonous (oxalic acid). 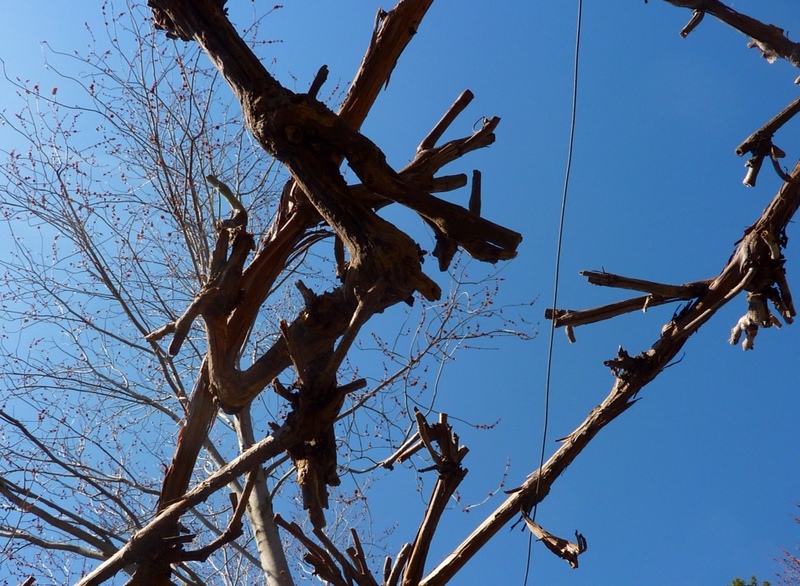 I prefer sumac – it is plentiful, easy to use, and a native plant besides. 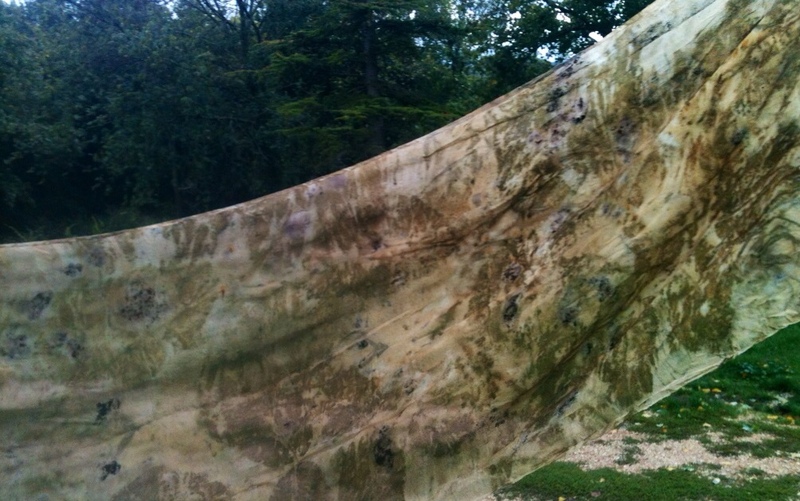 Using native plants is one of my aims in dyeing. 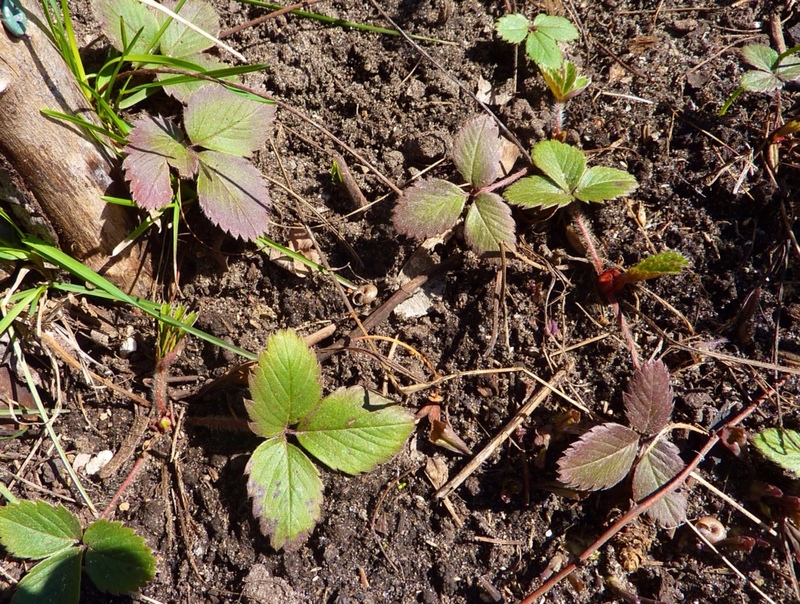 Alpine Strawberry is good as ground cover – it selfseeds, too. It makes a lovely clear print. 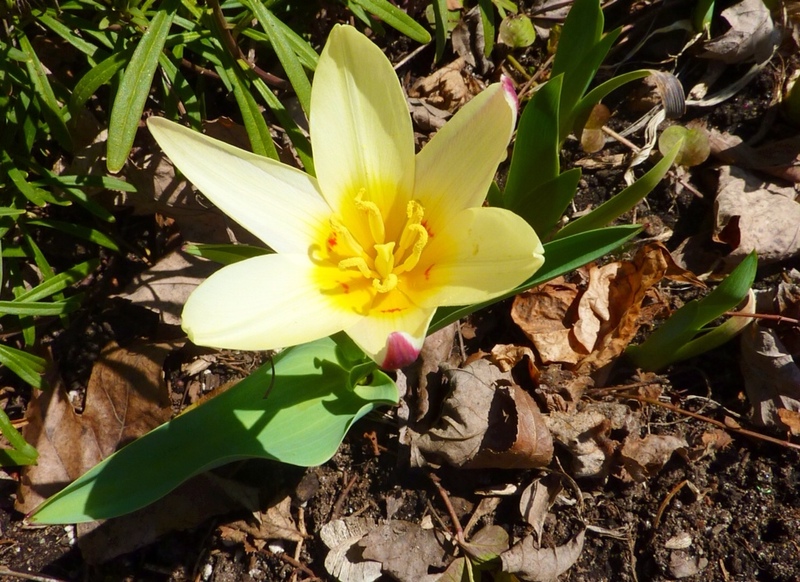 The Tulipa Tarda was tardy indeed this year. I will not print it- too lovely to pick and too few in my garden. 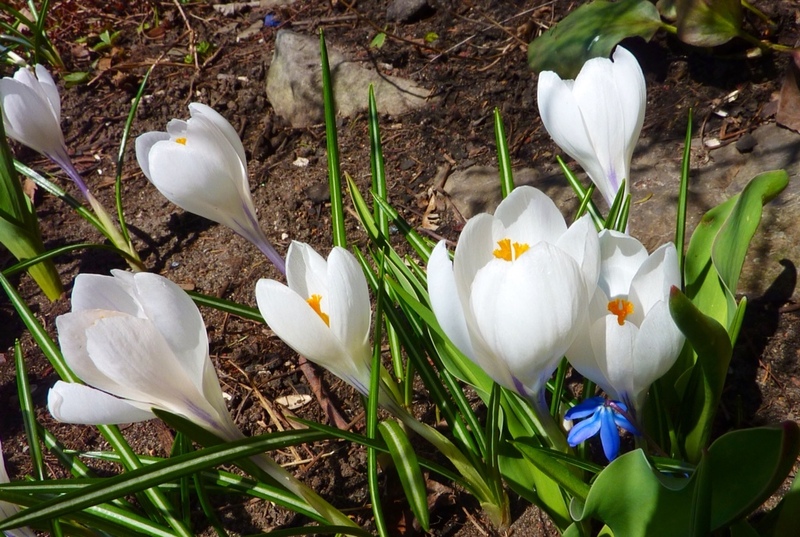 The crocus prints beautifully, petal, stamen and leaf. Plenty of those! 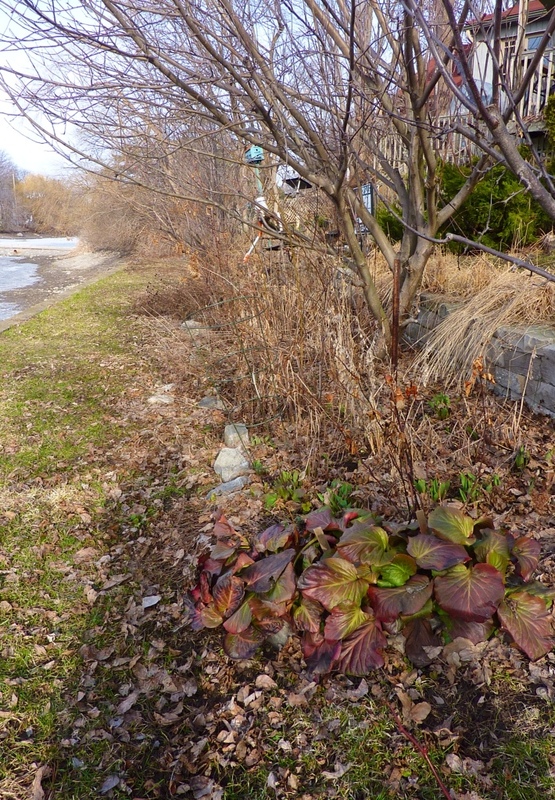 But I have to wait some weeks longer for other plants to print…the trusty Bergenia is up but not much else on the long border beside the canal pond. 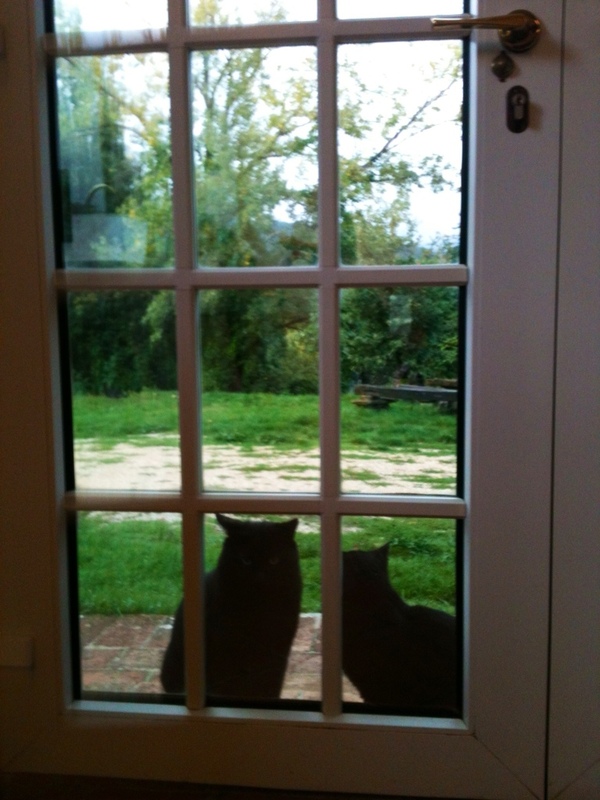 Buds, branches, barks, catkins. This late spring is giving me many of these to print while waiting for leaves and blossoms. 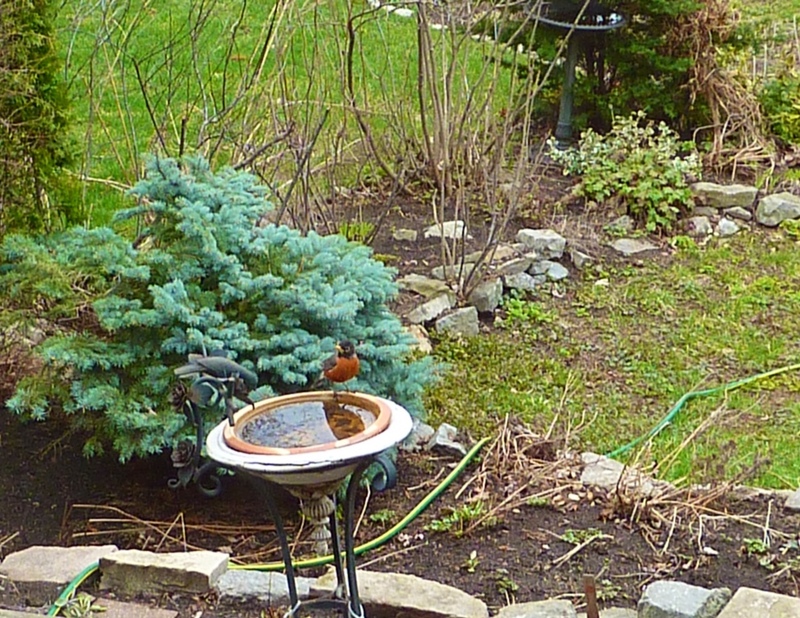 But it is spring nevertheless and the robin is back in the dye garden. While waiting for the garden to provide, I forage in the kitchen. 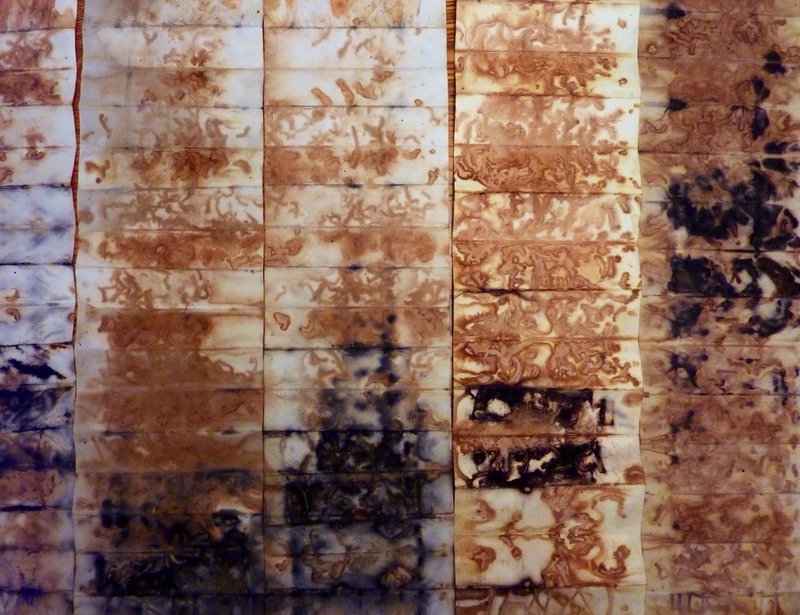 These accordions were printed with black tea and bits of iron on 140 lb. 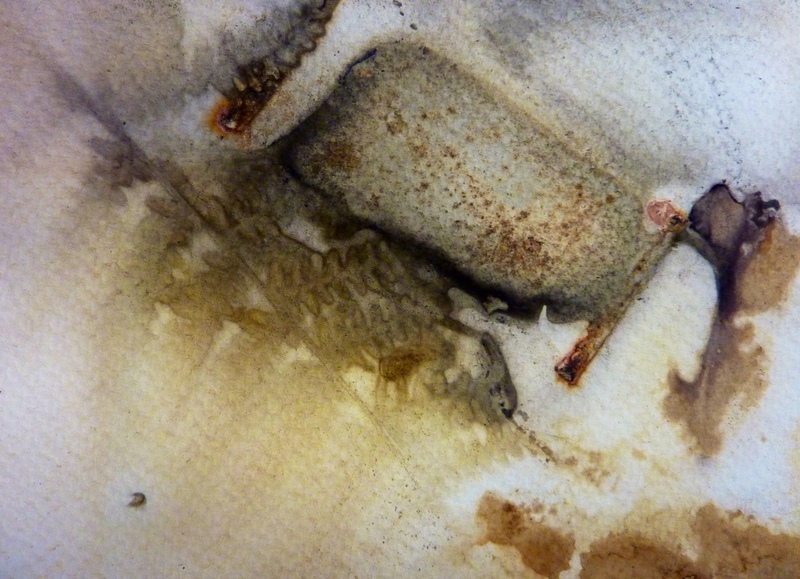 water colour paper, Saint Armand “Canal” paper (somewhere between 140 and 80 lb. in the weight) and 80 lb drawing paper. 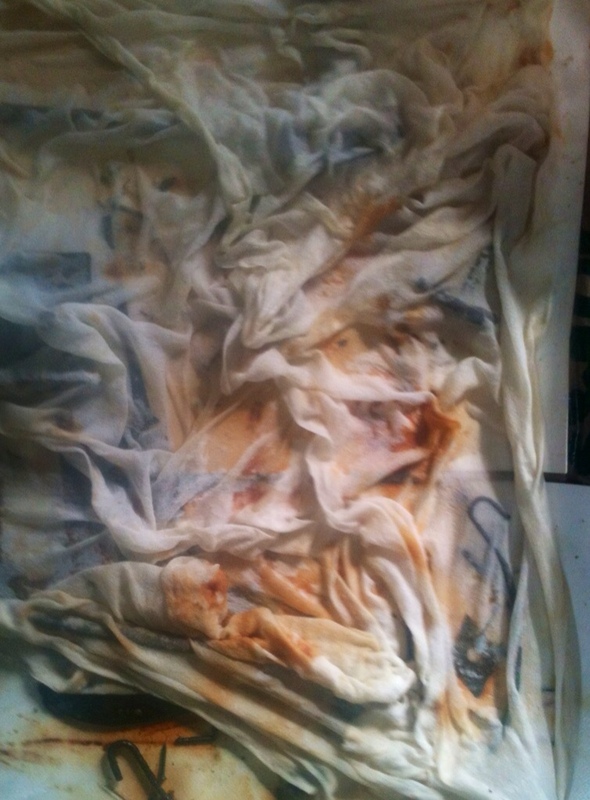 The papers were steamed after soaking briefly in alum acetate mordant. 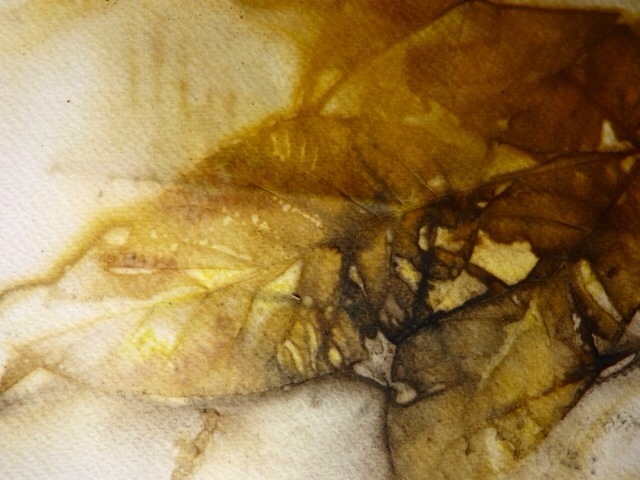 Taylor's of Harrogate black tea, Darjeeling, dried leaves. 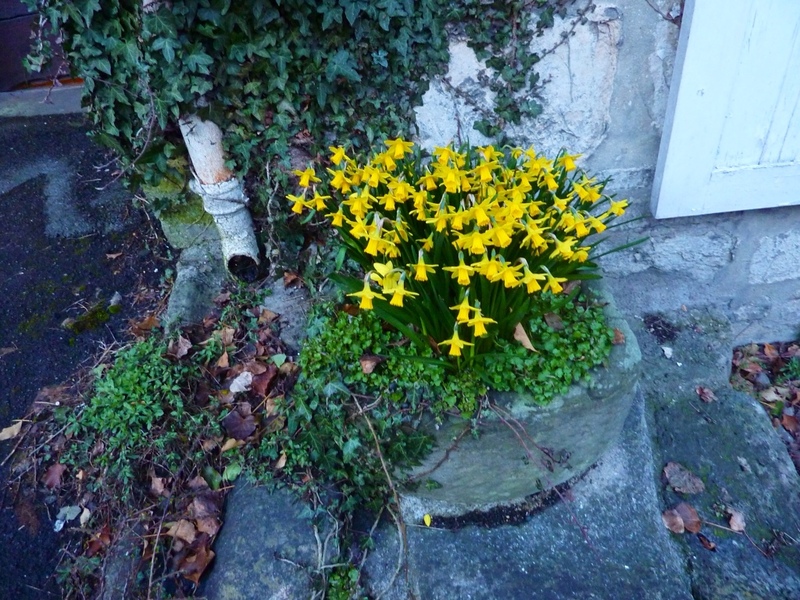 Tiny daffodils in a stone planter. The streets through the village are so narrow that the front gardens can only be made in wee pots on the front steps of a house or on the sidewalks. 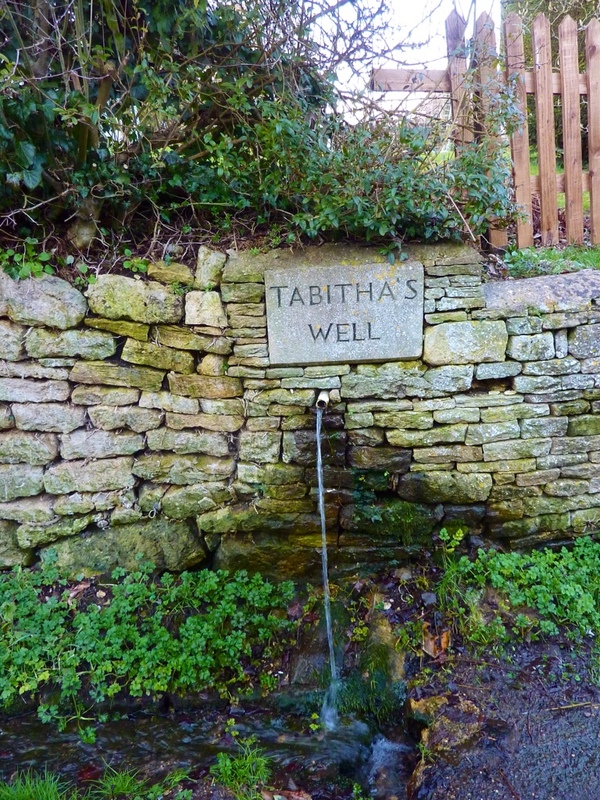 Tabitha's Well in Painswick. 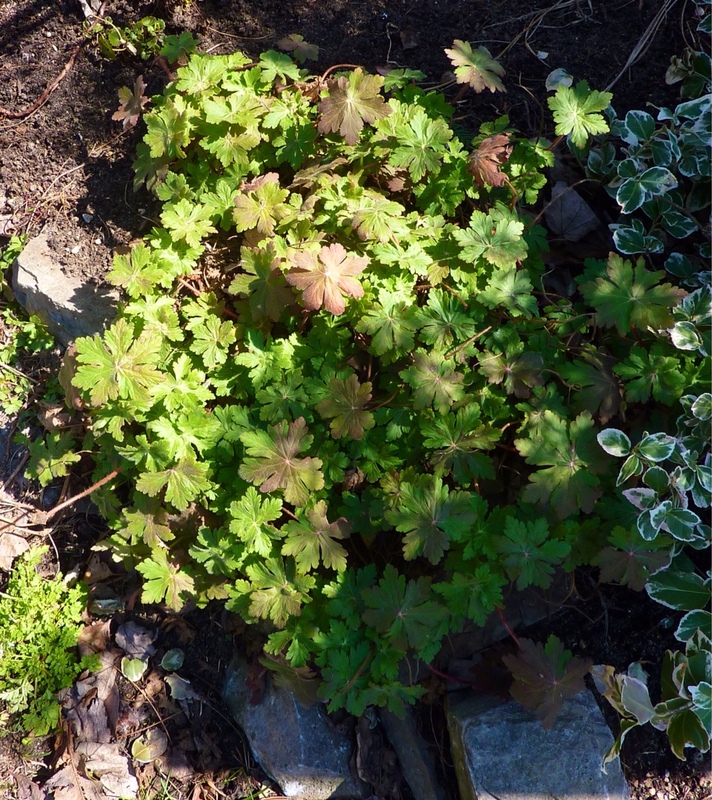 The Celandine grows abundantly there. The water runs down a steep hill to a river where the woollen mills used to be. 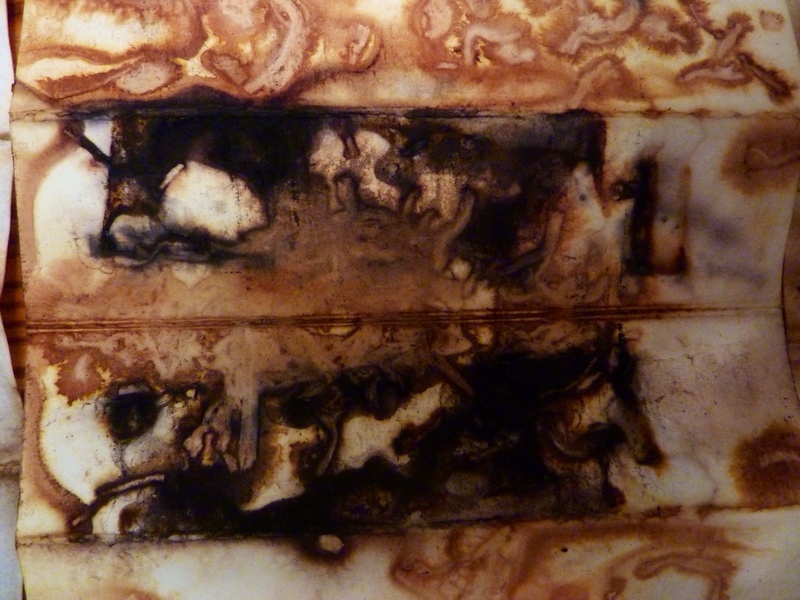 Next post: The tea-stained accordions will be…?